Backpacks are a curious body, both physically and historically. After wading through the mucky waters and realizing the topic would quickly become too cumbersome for a complete analysis/review, detachment led a path to hiking as a sub-category. And to deplete what is an equally dense subject into something more manageable, the hiking went to ultra light weight backpacking. This decision was not so much because of a necessity to build a light weight bag, but because of the insistent philosophy to travel light (lighter than what we may be used to), and also because within the ultra light weight hiking community many people have taken it upon themselves to make their own gear, beginning with their bags, using the simplicity of the past with improved technologies of the present. This topic provided a lot of the visual research for what certain bags lack, and what certain bags achieve in terms of formal/functional decisions. 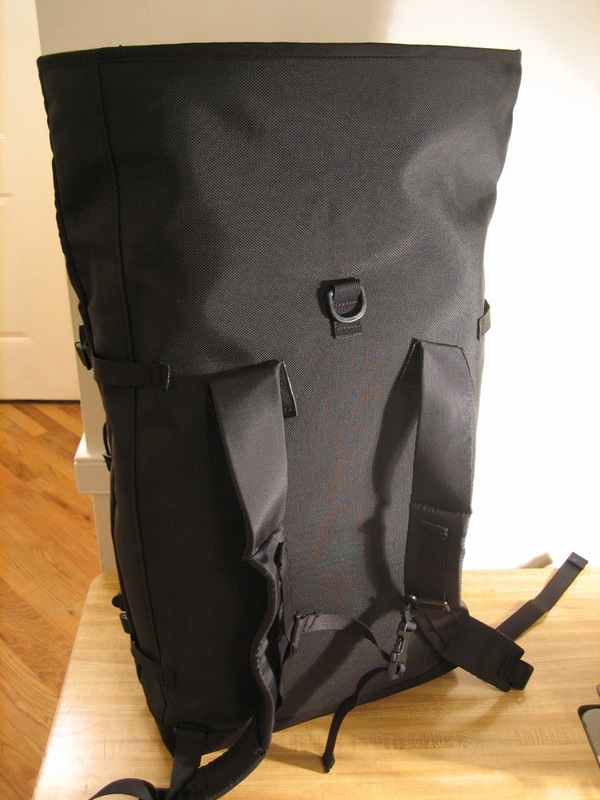 Many of the light weight packs have few pockets, and few outside features, other than a couple mesh pockets to hold water bottles (very good for drying items while you hike too). These packs seem to have a commonly designated method of closure also, done by simply using a drawstring top that gets folded over a few times and then clipped shut (no need for flaps here). Another curious thing about this move towards a light weight hiking pack is the way people have come to use their sleeping pads as a structural support for their pack instead of a conventional frame (either internal or external). 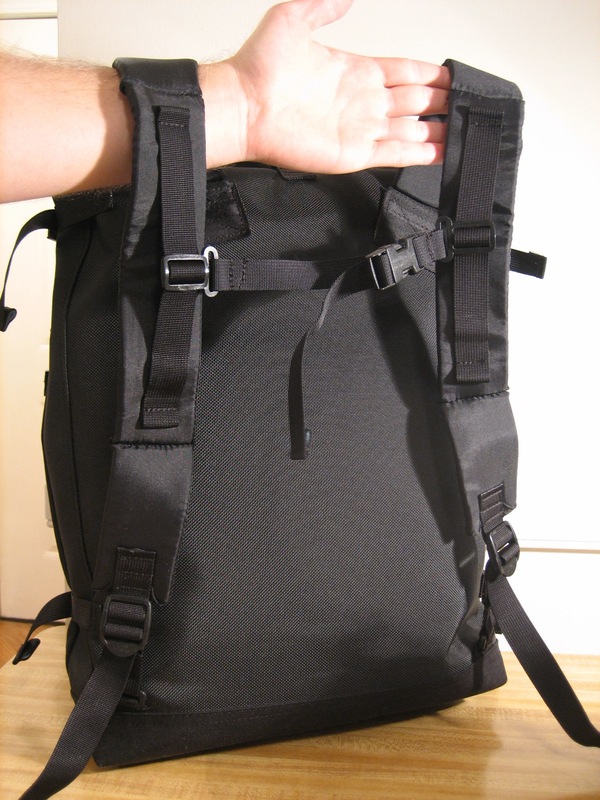 In hindsight, it should seem obvious that if you wanted to make a lighter weight pack for hiking, then not only does it need to be made of light weight materials, and only carry the essentials, but it should be able to increase how your various items can be used – thus reducing the number of items you need without lacking fundamental tools. By packing the bag a certain way and using your cargo as a support** this achieves lower weight – no frame is necessary – and increased efficiency – your cargo is now doing two jobs. This argument may be back and forth, and also depends highly on how much of a load you plan on carrying, but it is a very simple solution to a complex problem. Some of the bags found, went so far as to use your socks or other small clothing items (not the ones you would be wearing, but your extra set) as the padding for the shoulder straps, which were essentially pockets. This may be even more intriguing, because anyone who has spent an extended period of time cycling with a “messenger” bag, knows how important it is to pack it a certain way for it to rest on your back comfortably and securely (maybe the connections are unravelling now between the Dow bag and the walking bag, how form can influence the form of something that seemingly accomplishes a different task, obviously in this case the stretch is not that far – cargo hauler to cargo hauler). 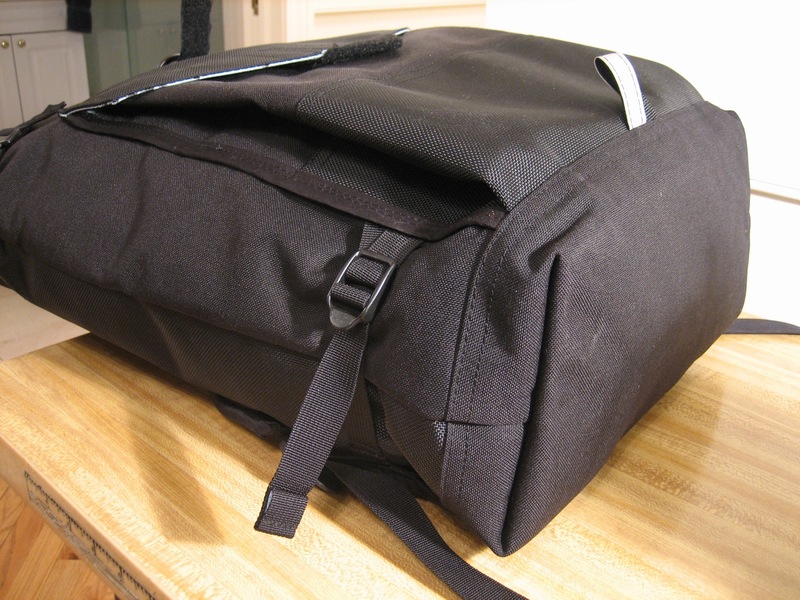 The “roll-top” was also going to be a re-occurring theme as the bag developed. 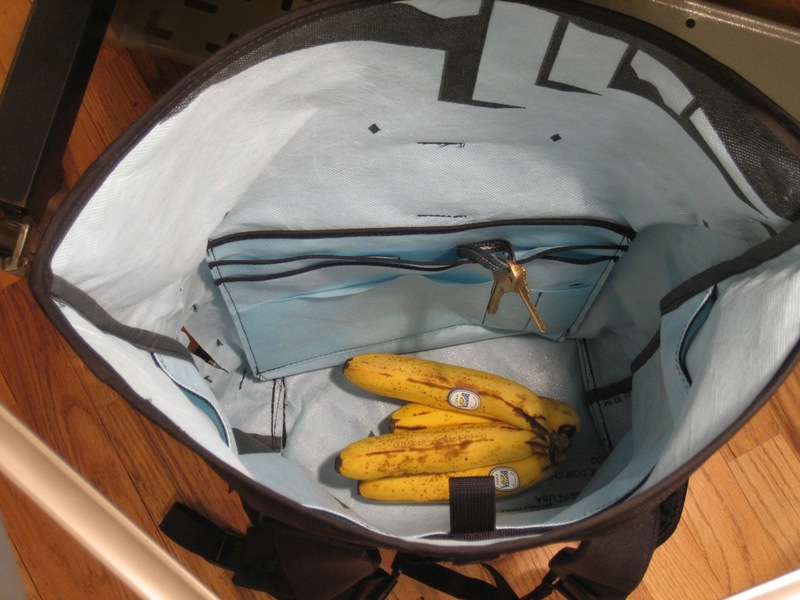 There are many cycling “specific” bags that have been produced lately, and for some reason they often use a “roll-top” closure, while it is not particularly clear why this is so common, it is a simple design that greatly prevents any water leaks through the main opening. 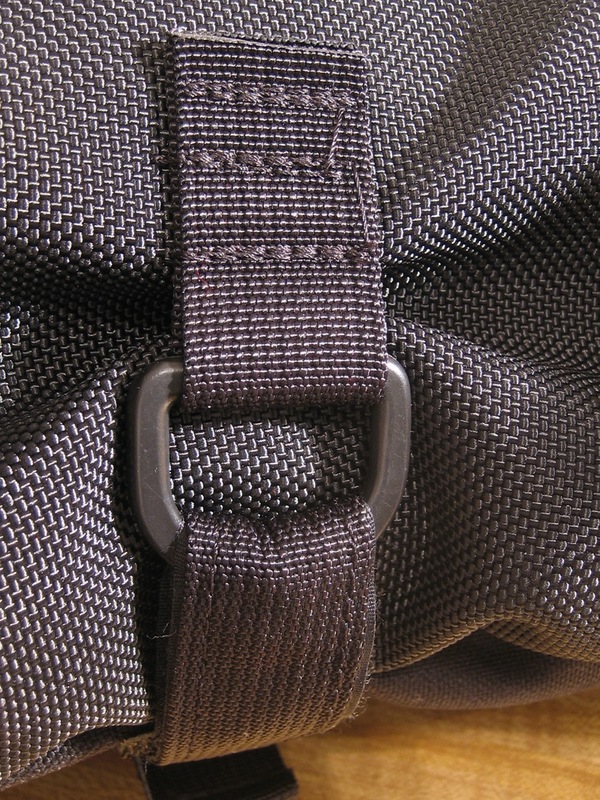 An alternate to the “roll-top” closure is a semi “roll-top” closure, where the flap is actually being folded or creased below the level of the material that constitutes the opposite side of the bags main compartment that the flap extends from. 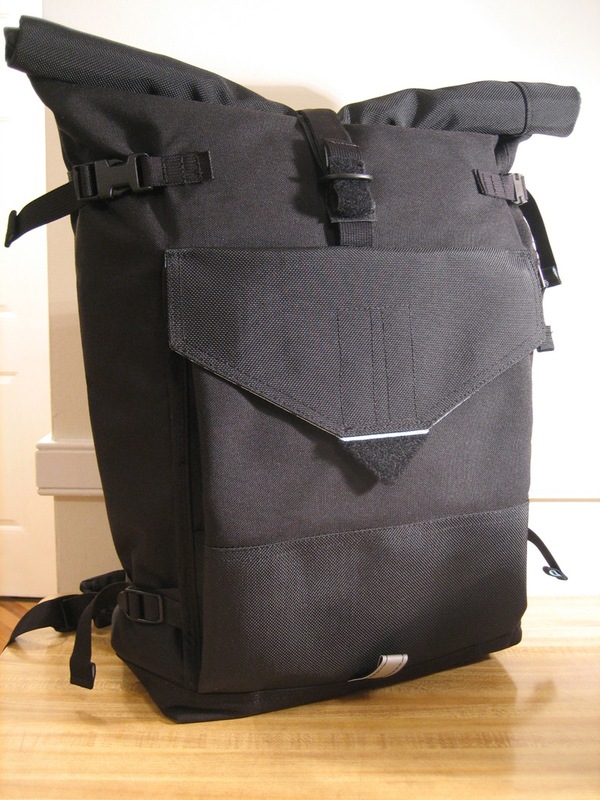 Of course when thinking about cycling “specific” bags, it is hard to forget the Ortlieb Messenger Bag Pro which is (probably) responsible for bringing the “roll-top” to cycling. 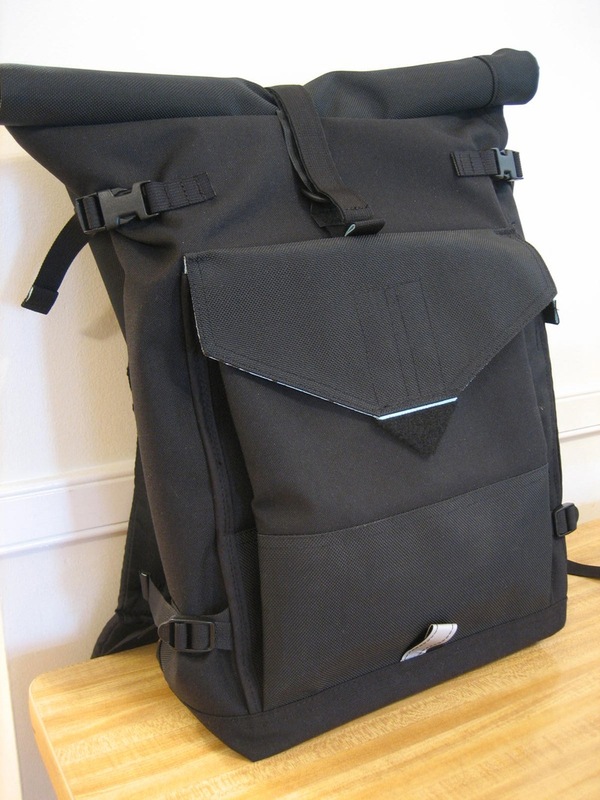 These are probably the only backpack style bags, that have been consistently used in cycle messengering over the years (of course many “messenger bag” companies now offer “backpacks” – but none have the history like that of the Ortlieb). The Ortlieb bag’s principle comes from the kind of dry-bags one would use on a canoe trip or kayaking, this is a standard way to close such bags because again it is the most water tight. Since Ortlieb has made water-tight bags from their inception we can see the link here between their Messenger Bag Pro‘s design and their other products. Another thing to highlight is how the Ortlieb company typically mends their bags together, since stitching is not water-tight, Ortlieb “welds” their seams. This is more or less a very simple way of saying to glue with a lot of precision. Unfortunately, technology here is not that far advanced, so we’ll keep on stitching for now. 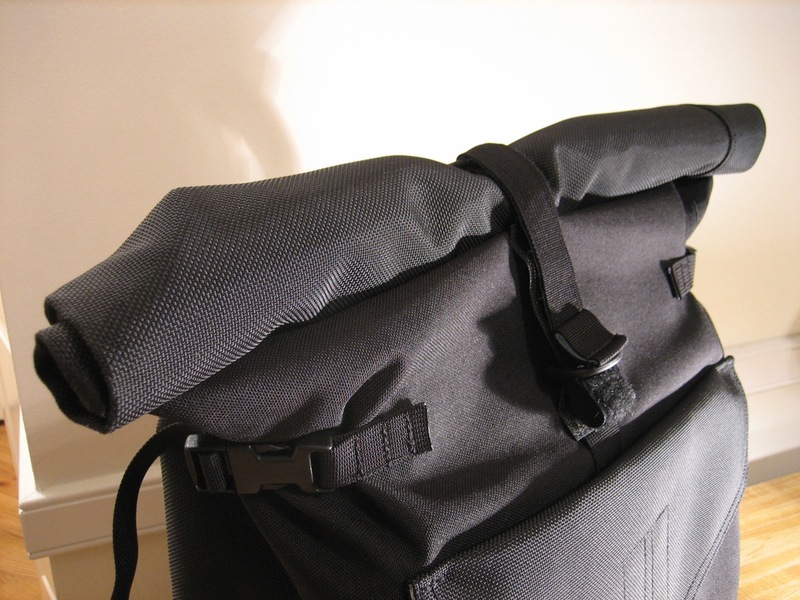 Dry bags – “roll-tops” – Ortlieb dry bags – Ortlieb “roll-top” Messenger Bag Pro – thus function becomes form, and now form returns to function, and function becomes form, and back again to function(?). However, the most interesting research behind the walking bag was in the Duluth Pack. 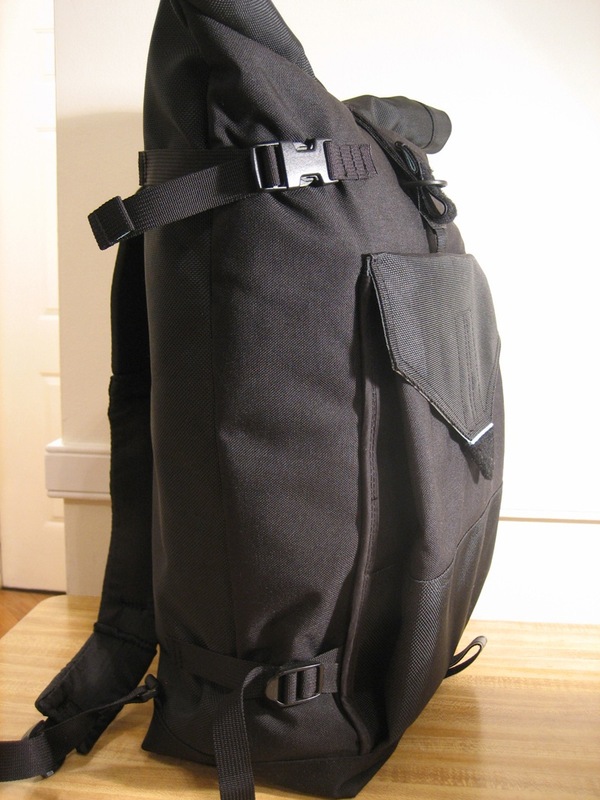 The Duluth Pack, was/is kind of the meeting point of all the other mentioned bags, and is an example of where some of these contemporary features were cued from for the walking bag. These peculiar bags were made for portaging about the North Woods, while travelling the many lakes and streams that are interspersed in the area. They were developed around the end of the 1800’s by a gentlemen of the name Camille Poirer who had settled in the area and found a custom pack necessary to his travels and work. Today the name Duluth Pack would be like Zipper or Kleenex, as many companies make “Duluth Packs” even though they are not made by the Duluth company – in Duluth, Minnesota. As a modern bag, it is now a standard for canoeing and even comes in three or four doctrined sizes no matter who the maker is; a 3, 3.5, 4, & sometimes 4.5, which can easily be factored to figure out how many can fit in certain size canoes. Due to it’s specific design, the Duluth pack allows one to wear it on their back and carry a canoe over their shoulders without the two coming into contact, this is very important because when portaging a canoe, you use your shoulders to support it and it’s weight (sometimes along with a tump-line which transfers weight to the spine, another debate). Also, it is made with a very square format to easily situate in the bottom of your canoe or other water vessel. 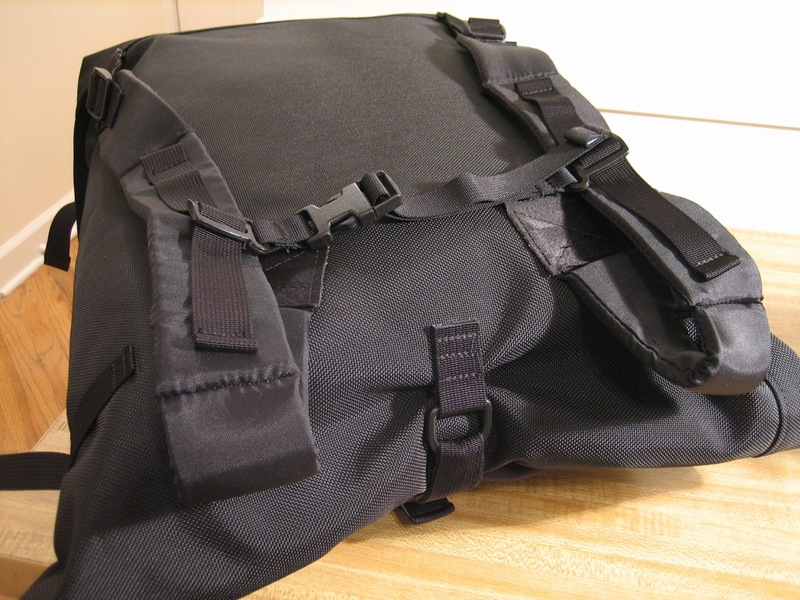 And although the Duluth Pack does not traditionally use a “roll-top” closure, it does have a rather large flap over the top, somewhat similar to the semi “roll-top” bags that other makers produce. 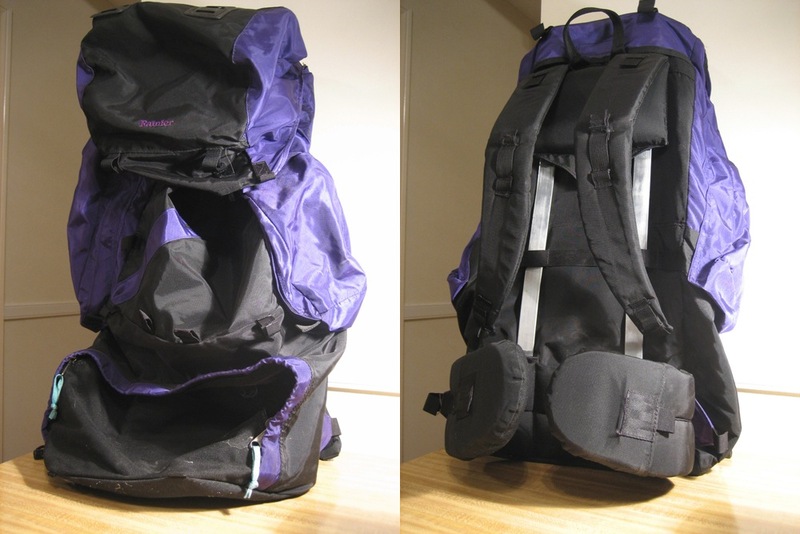 These similar low profile designs have a coincidental connection in that both keep the pack from climbing much higher than your shoulders. For portaging this has an obvious advantage; for cycling this is good for increasing visibility, as you can tilt your head back, with a helmet on, and not feel any restriction from your bag. If you have hiked enough with larger packs, you understand that you can only tilt your head back so far before it is resting on your pack, and when you are leaned over on the bike, this exaggerates that kind of cause and effect, so by lowering the over-all stance of the bag it greatly increases head mobility, even with a helmet on, which usually means safer riding (i.e. being able to look around, helmets of course increase safety too). 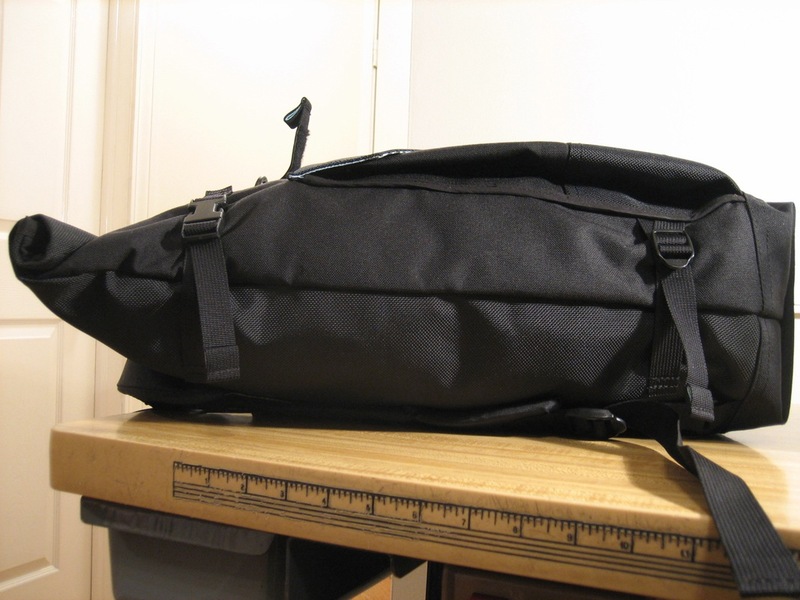 Maybe the low stance, and the square format of the Duluth Pack point to why an Ortlieb Messenger Bag Pro is designed the way it was, water proof/resistant, loads of head clearance, square format fits both hulls and files, and so forth. 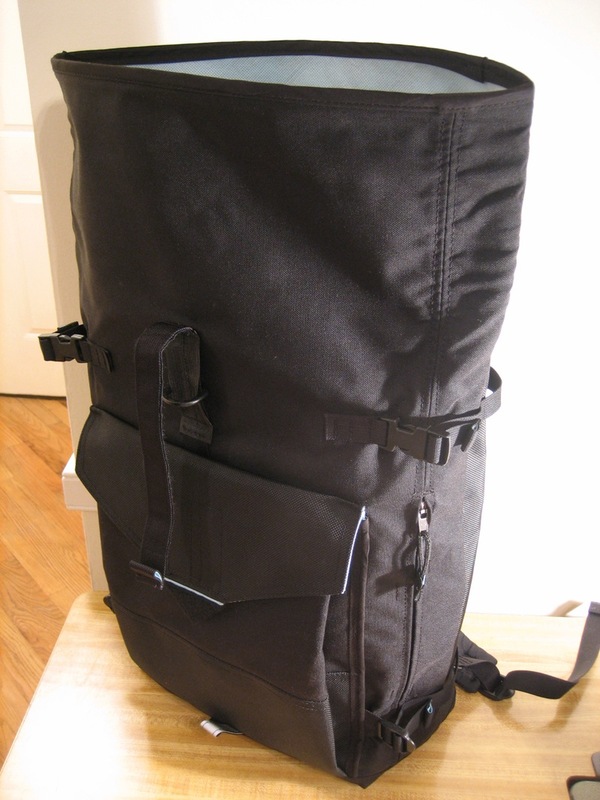 **Here is an appropriate article on another Homemade Backpack. This article is not only written with the kind of fastidious approach that making such a homemade pack deserves, it even makes some of the best examples of how structure comes from all-over the board type concepts. 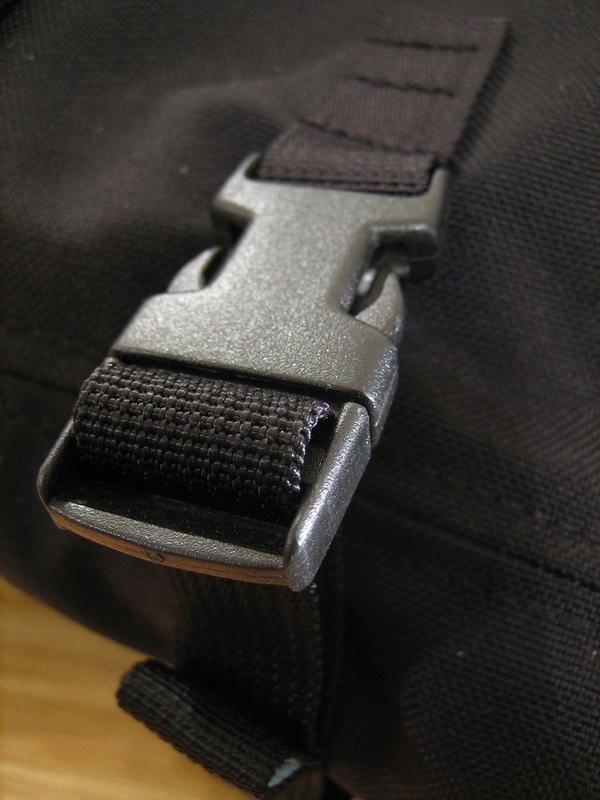 Read through and see how this person developed a webbing belt which truly uses the pack and it’s contents to distribute the load effectively, and how the maker created an anchoring system for the shoulder straps that goes beyond normalcies. These ideas push the envelope on how multipurpose essentials can be (whether hiking across the country, or to your local corner store). 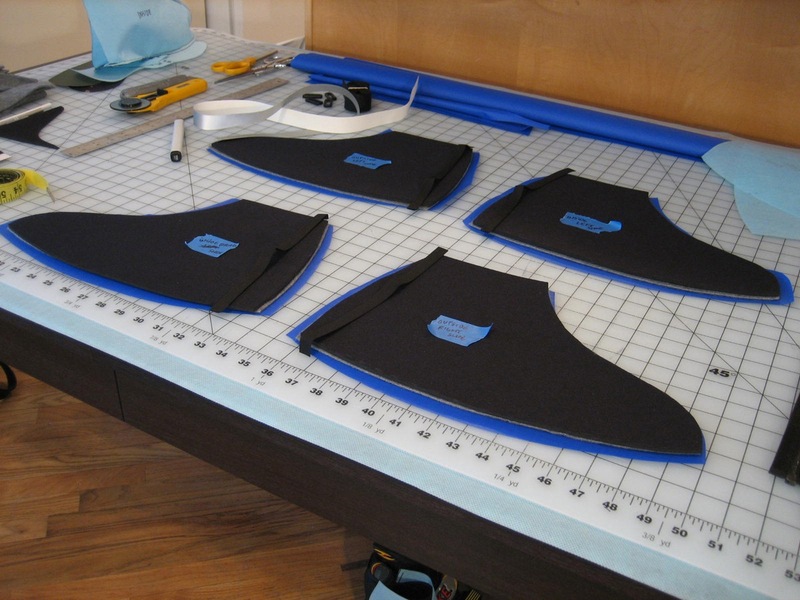 Many compliments go to Jeff Walters for writing such a detailed article that dives into the matter of how soft goods and sewing can be the basics of even the most complicated structures. This article was found at BackPacking.net/MakeGear. The walking bag was a slow process, fortunately, the extended building schedule allowed many nights to contemplate whether or not the tactics at hand were working for the better, or for worse. The first thing to shape the project were the materials at hand. An old CampTrails backpacking pack had recently turned up (purchased in 1993), so all the little hardware would be easy to get, plus there were lots of straps/webbing that could be re-used as they were quite long even after being cut off the bag. And visually speaking, there seemed to be just enough Cordura left over from the Dow bag, to use those scraps, saving money on the main compartments materials. 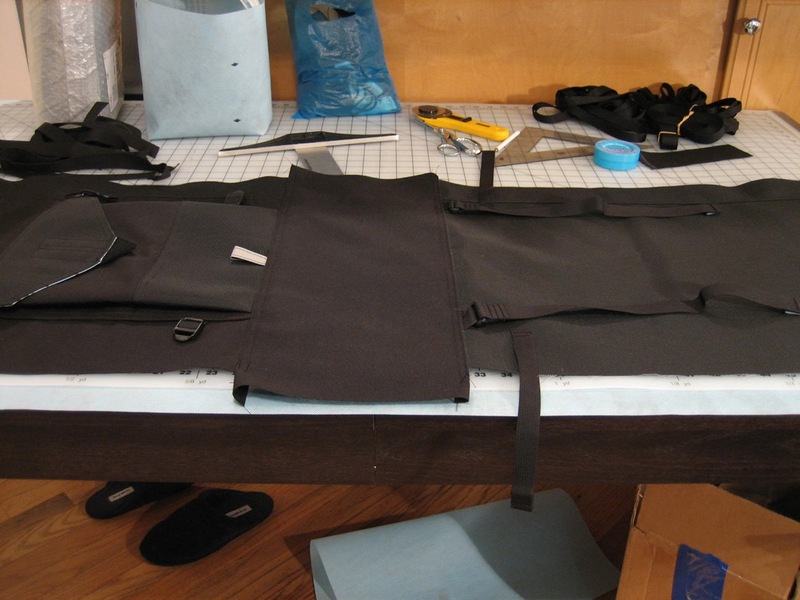 After stripping the CampTrails pack of it’s re-usables, the next order of business was to patch the Cordura pieces together and see if there really was enough to make it happen – a completed bag with the rough dimensions of 15″X19″X6″. 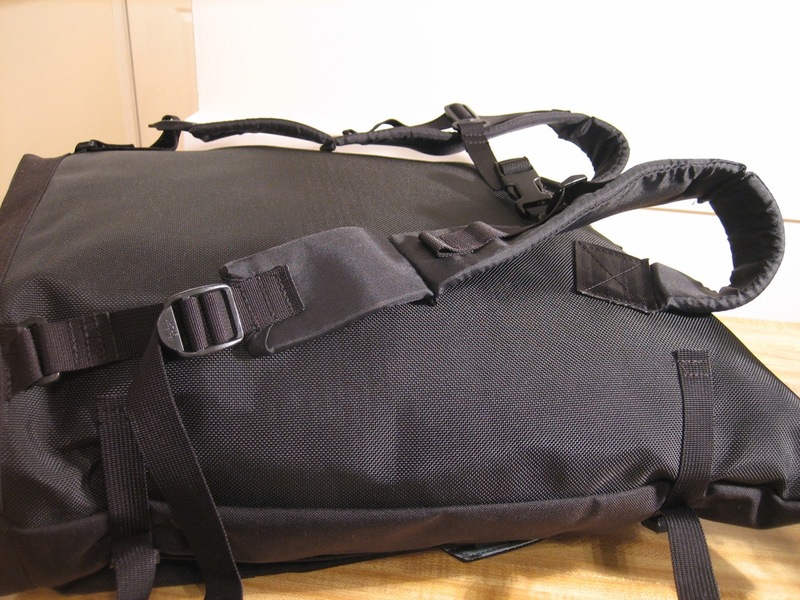 The nylon left over from the Dow bag was the 1000 denier Cordura used on the flap and the Ballistics Cordura used for the boot. The 1000 denier piece was shaped like an “L” and the Ballistics was in a rectangular format. 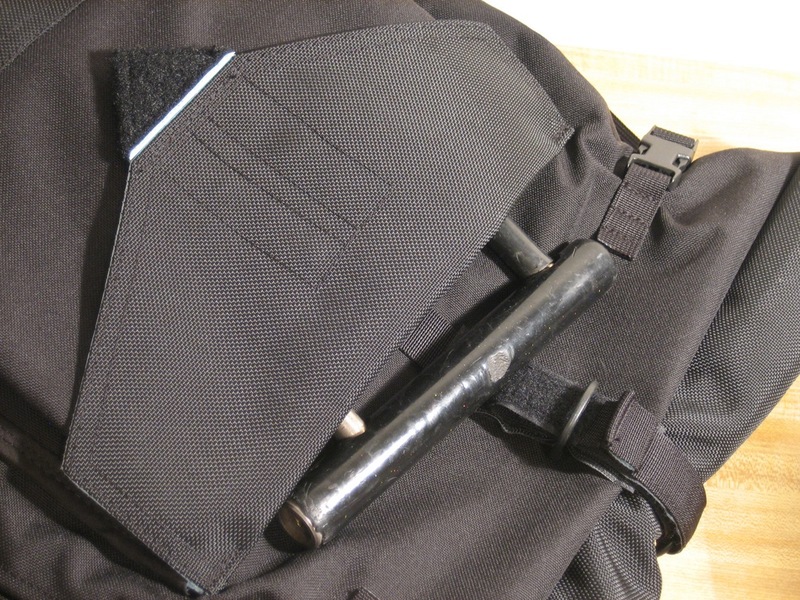 Cutting the 1000 denier “L” shape into two uniform’ish pieces was just enough for the front panel of the bag and a boot for the bottom – plus a little extra, and the Ballistics piece was enough for the back panel. Luck came to, in that after these main pieces were cut there was still enough left of both to make an outside billowing pocket, like the three that spanned the front of the Dow bag. Away it went, the two large pieces were stitched together to make a roughly 22″X58″ section; the seam was exactly in the center of the two (each piece was originally 22″X29″), so that would end up working quite well – after the boot was placed over this section – “protecting” the seam between them (and hiding it). 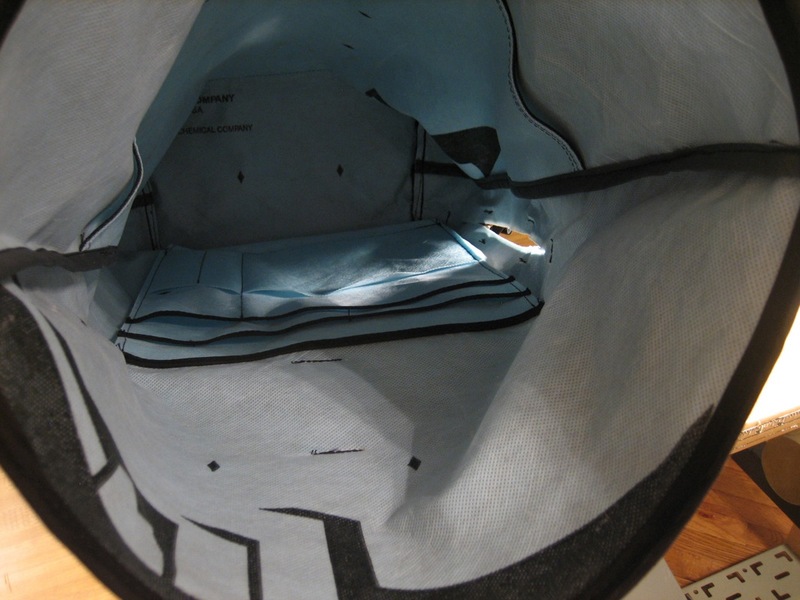 Then a 10″X20″ piece of the 1000 denier Cordura was set aside for the boot, and the few left over pieces started to get spliced together to make the outside billowing pocket. Of course there were lots of lining pieces to be made/cut for all of the bag’s separate components, these were taken from good ol’ trusty Dow Weathermate, which there is still a surplus of (if it is not clear already, the Dow Weathermate will be a re-occurring theme until further notice). The outside pocket ended up being a kind of miniature bag with a lower half made of Ballistics, and the upper half made of 1000 denier Cordura, and then the flap on top which is made with Ballistics – on the outside face, that was then lined with Weathermate. 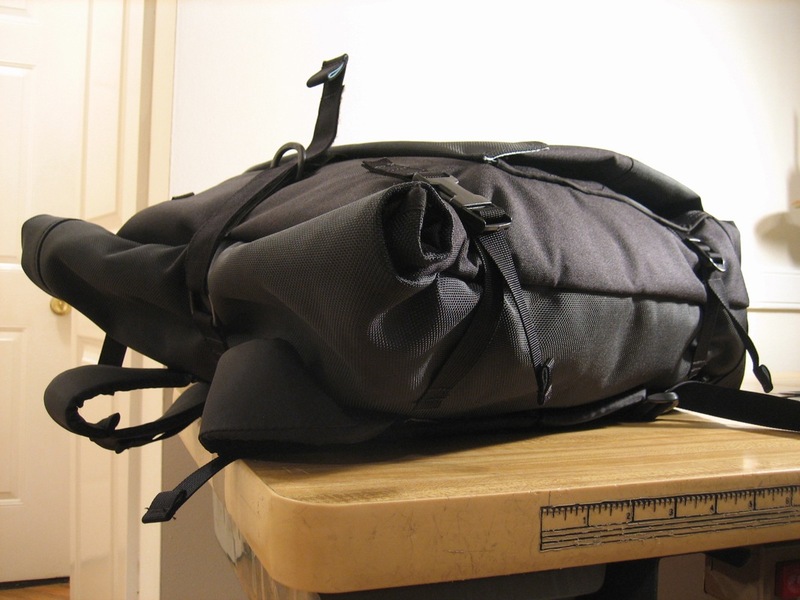 The pocket’s rough dimensions are 10″X12″ – which ended up making two pockets, the one with the flap, and then a second one behind that which would become a quick access pocket – appropriately thought of as the U-Lock pocket, this was accomplished by only sewing the body of the flapped pocket along the bottom and two sides, leaving the top open like a back pocket on a pair of jeans (rather than sewing the outer perimeter of the billow pocket right to the bag, flap and all). 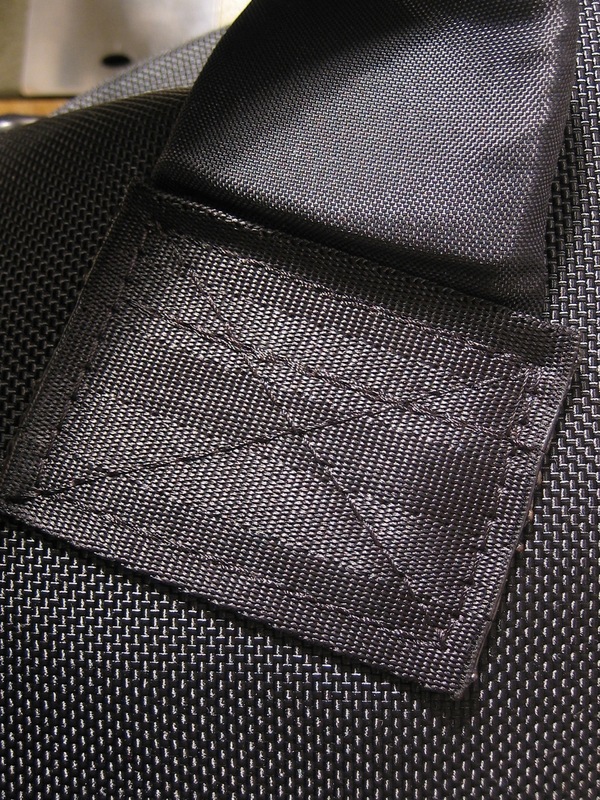 With the addition of Velcro to the outer pocket’s flap, the billow pocket was ready to set on the back burner while the rest of the bag was put back on the chopping block for further trimming. Now with the exterior body (piece) laid out, pushing the other pieces around began. 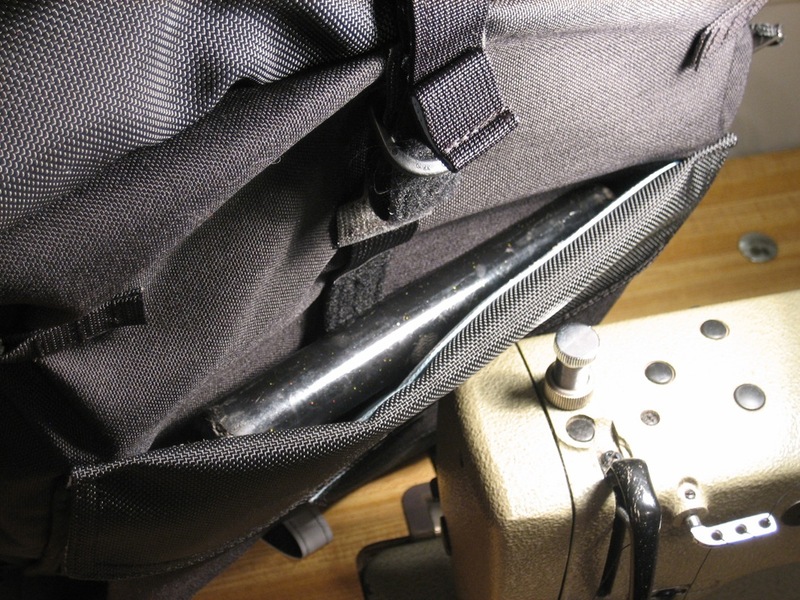 The idea was to get a feel of where a few compression straps might be placed, where the shoulder straps would be situated, where the lash would be placed to keep the roll-top rolled up, and then finally where the outside pocket would live in relation to all of those pieces. There was one major glitch that side-lined all of this, the main body’s pattern had been cut to the wrong dimension. 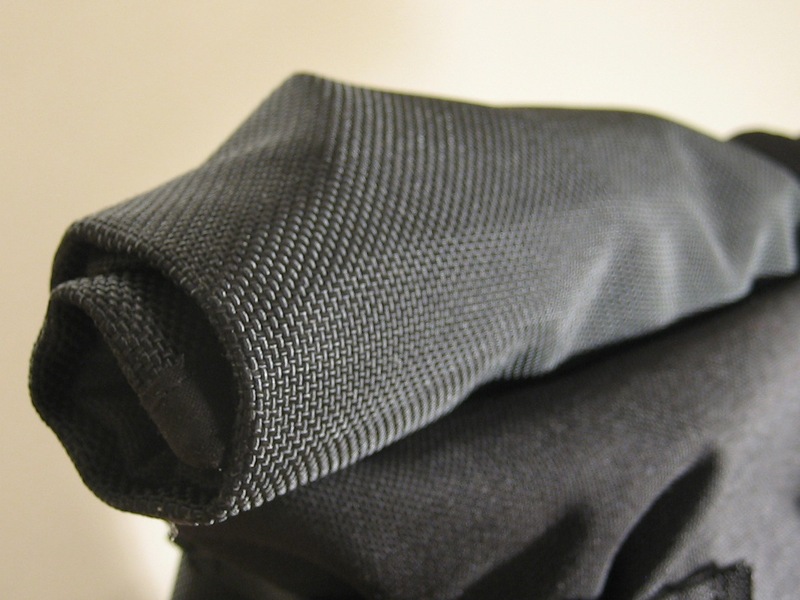 Essentially, instead of cutting that (very limited) bit of nylon to the proper width; the dimension it would need to go from the center of one side, across the front, and then to the center of the other side – the material was cut to accomodate the front span of the bag as if it would not have sides extending from there. In short, the main body was cut about 5″-6″ too narrow (17″). Fortunately, the strip that was sophomorically lanced, was still around for the consideration. It came down to either A) making the bag smaller than expected, or B) figuring out a way to use this senseless move as a performance enhancing option. Of course, B was the only way to go, and the pieces were mended back together, but to make it look less like a mishap, and more like a highly sought-after feature, a YKK marine grade vinyl coated zipper was embedded into the resulting seam. Now the roll-top bag had another quick access feature, in a pinch you could/can easily get into the main cavity without unrolling the bags top. With the zipper installed, there was still a miscellaneous seam unaccounted for on the Ballistics side of the body, but that was a small issue by now, as this extra slot eclipsed all past discouragement. 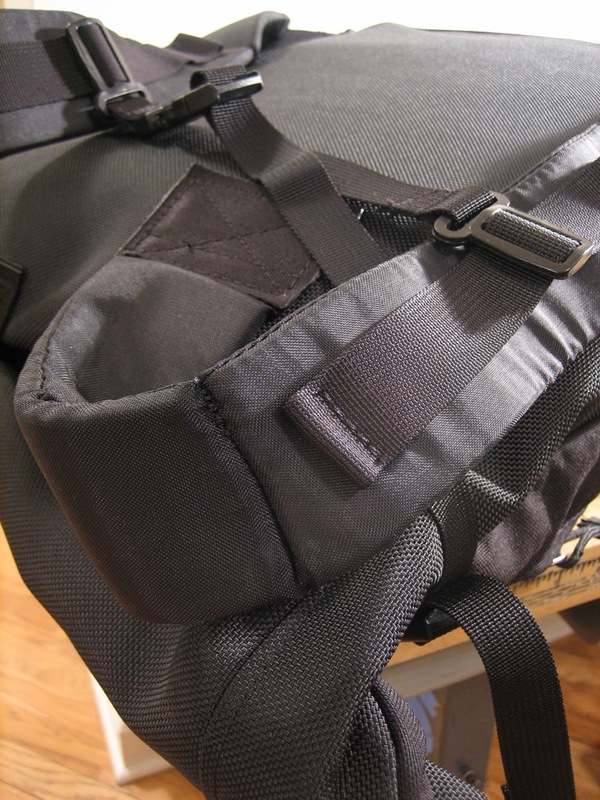 Over-all this extra seam was almost nonexistent, at most, it created a very slight amount of extra bulk for the “roll-top” feature – on the left hand side (stage left) of the walking bag, which was barely noticeable. 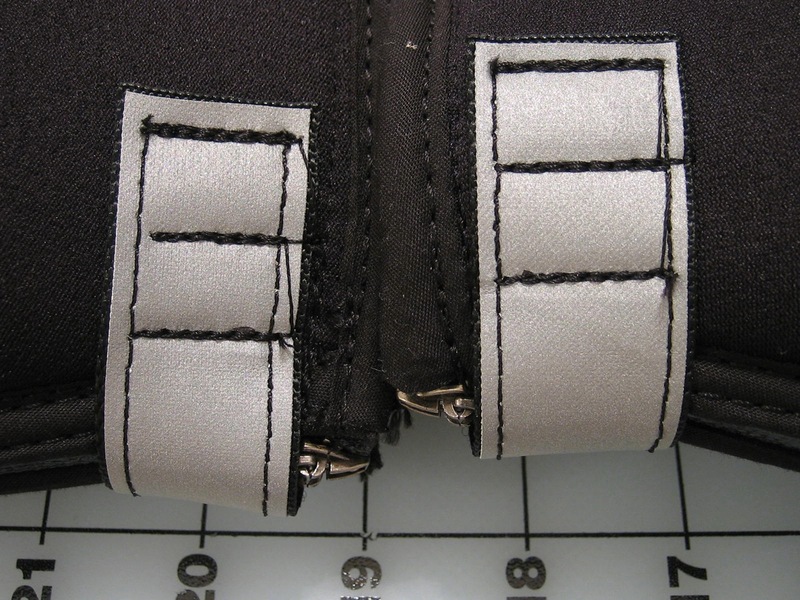 With the pocket system waiting and the zipper/seam configured the next step was to attach the pocket, tucking one set of ladder lock buckles into the lower half of the two opposing seams – with a bit of webbing. Once that was placed, the flap on the pocket was tacked into the main body at the outer corners to ensure a good fold that would naturally encourage the flap to stay in a closed position. After that, the front side at the top edge of the boot was stitched in, this effectively sealed up the bottom of the pocket and created extra strength at the bottom of the zipper’s opening too. The zippered seam travels from the top of the boot to the top of the billowing pocket (approximately 12″). With one end of the boot in place, two simple structures of webbing and 1″ loops were put together to be stitched into the back side of the boots top edge, these loops are where the webbing for the shoulder straps would eventually be anchored in. 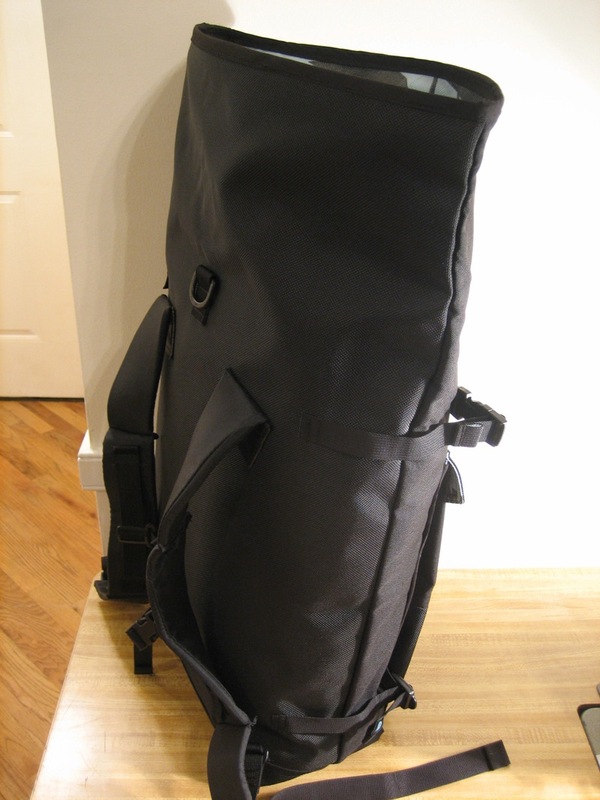 With the boot completely in place, the rest of the outer bag’s construction ramped up quickly. Some simple measurements helped locate the alignment and anchoring position for the webbing which would mate to the ladder lock buckles already in place. 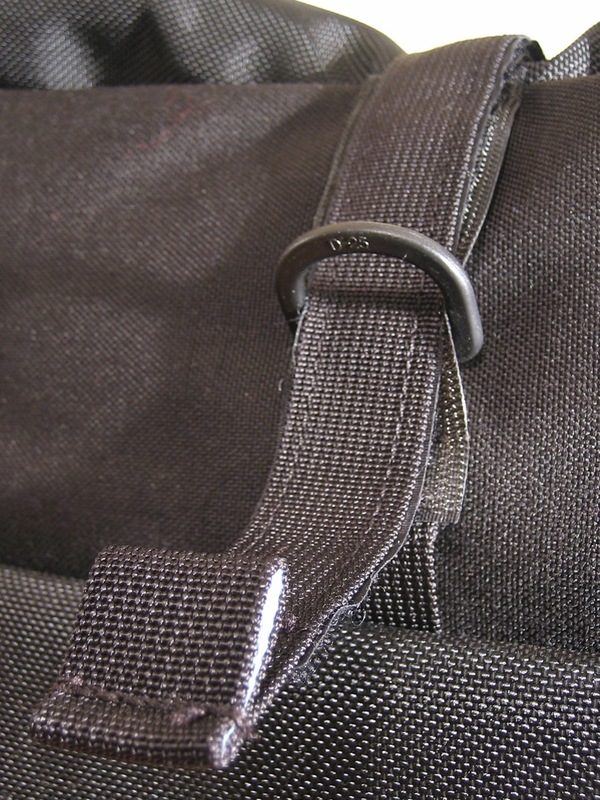 Then two more sets of compression straps were mounted towards the top of the bag, these were built with side-release buckles so that they could be loosened very quickly and closed very quickly, this seemed like the logical way to go – unclip, unroll, get to your valuables, roll it back up, clip it tight to keep the profile slim and get back on your way. These compression straps are probably a little tenuous as the bag is not really so large that it will bulk-wise, get out of control, but the added ability to lash the bag down and also create points to attach extra things is very convenient to say the least. The last thing to be completed at this point was how and where the lash for the “roll-top” would be placed/work. 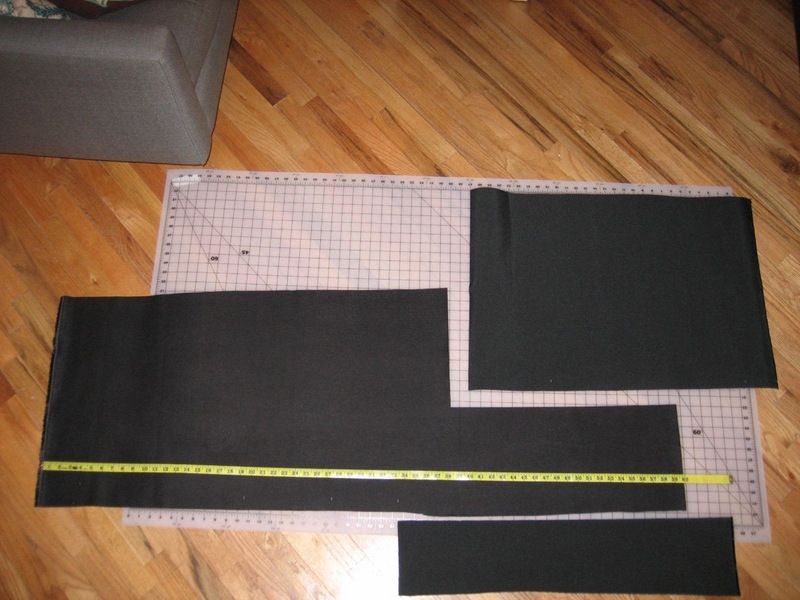 Considering that the bag would/(should – if we can remember how to measure) have a final dimension of about 15″X19″X6″ and the actual pattern is about (now – after re-attaching the cut portion, which was never able to completely re-coup the max-material, as stitching-in the seam caused about 3/4″ of loss in the nylon) 19″X58″ this tells us that with a base of between 5″-6″ that would make our height measurement to total at 26″. While this may sound too tall (well beyond the desired 19″), it is actually perfect, because it leaves us with about 7″ of extra material, which is what gets rolled up. 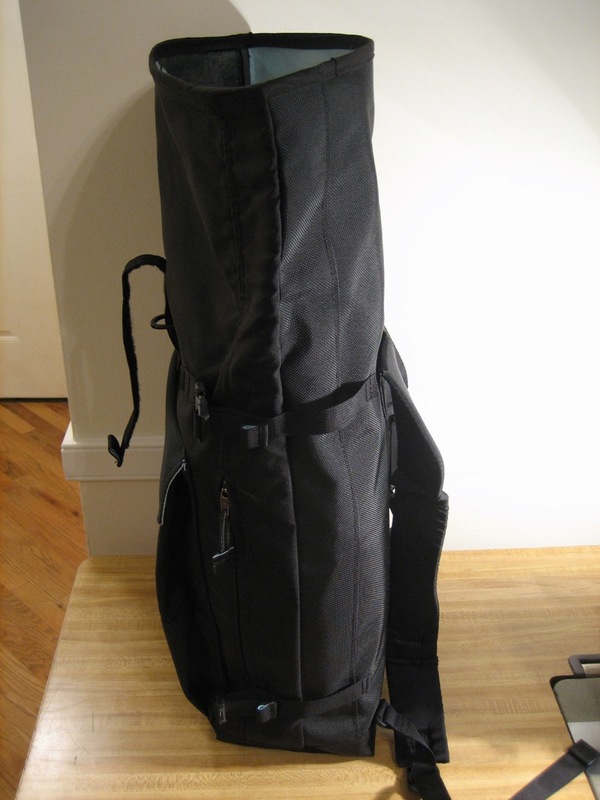 The actual bag, or complete cavity dimensions, are then 15″X26″X6″. 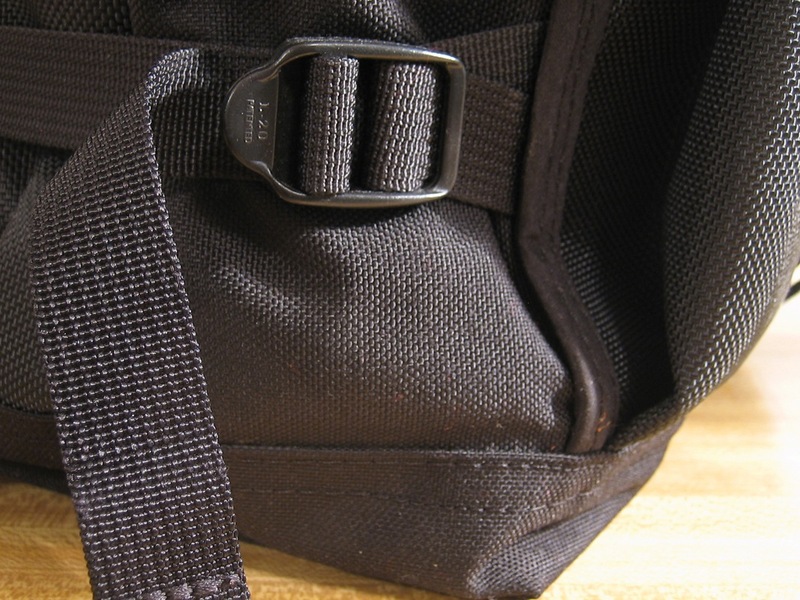 This is important to know because it designates where the lash for the “roll-top” will end up – 7″ below the top of the bag’s opening – centered. Of course, this is where the webbing and Velcro will extend from, so in reality another inch is added for stitching in the end of the Velcro-backed-webbing piece which comes up from the front, and an inch for tacking in the webbing that will anchor in the “D” ring/plastic-loop on the back side, that will act as the router for the webbing from the front – to double back on itself through/over. As you can see, the same “over the top, and back again” Velcro closure was used, as was in the Inclement Weather Shoe Covers2.0. However, this time instead of completely stitching down the Velcro (hook side) portion to the webbing, it was only tacked on, at the ends. What this afforded was the ability to have a floating “D” ring (/plastic-loop) on the front side of the pack too. 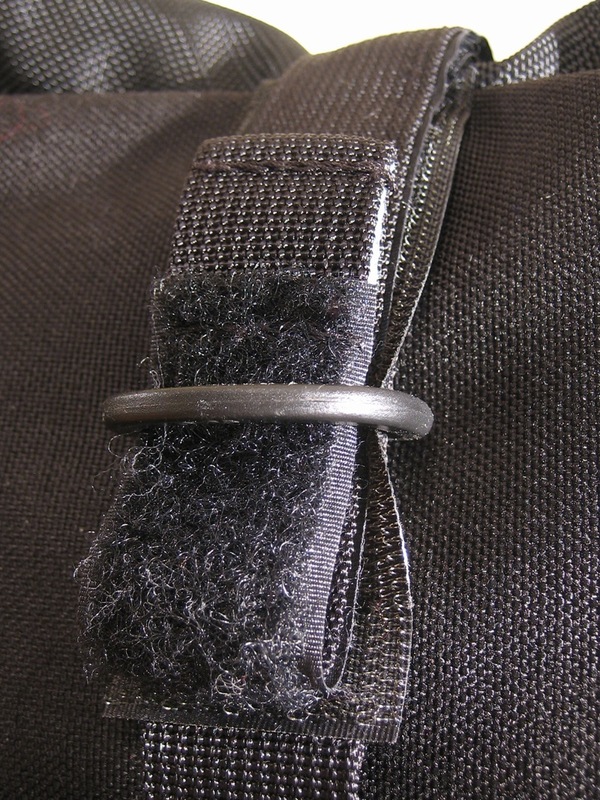 This “D” ring was intended as a spot to attach a second strap with a side-release buckle that could meet it’s mate coming from the “D” ring on the back – in case the Velcro did not work out. In good form though, the Velcro has worked out just fine, and in fact the “D” ring has become a kind of quick-release to open the bag; by tucking the Velcro under the “D” ring halfway, it keeps the Velcro from coming up, but when it is time to open the bag, there is an easy tab to pull it open with (somewhat similar to when/if you pick your vegetables out at the market and tie the bag with a loose knot that does not pull completely through, so that when you arrive home, you can pull the little bit that is still free in one motion, to untie the knot without fumbling). 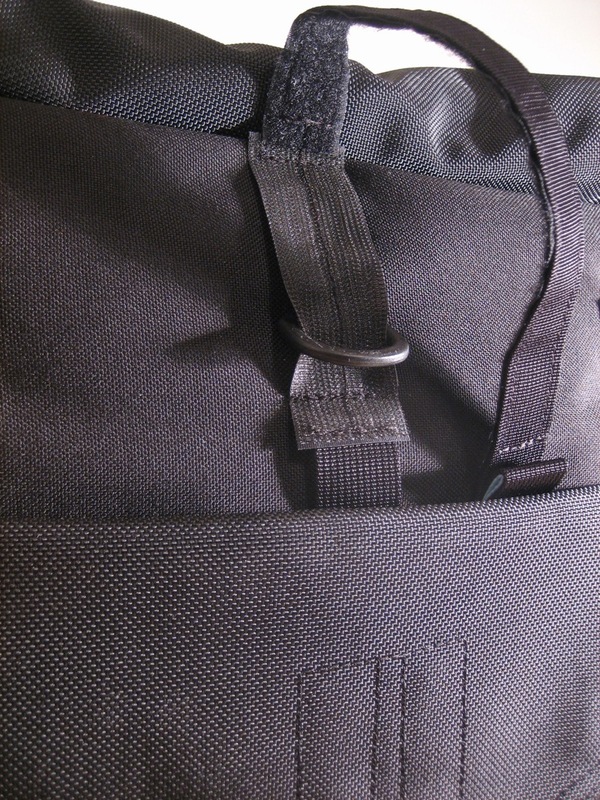 The only part of the outer bag that is missing now was the shoulder straps. However, these would wait while the inside portion was built because the shoulder straps would be stitched in over both of the materials to add strength. The inside portion of the bag was quite simple with only a surprise or two. Actually, the inside went together very unconsciously, and in hindsight it is hard to recall any lamenting of the process, other than whether or not it should have ten inside pockets, or five (or none, etc. etc.). 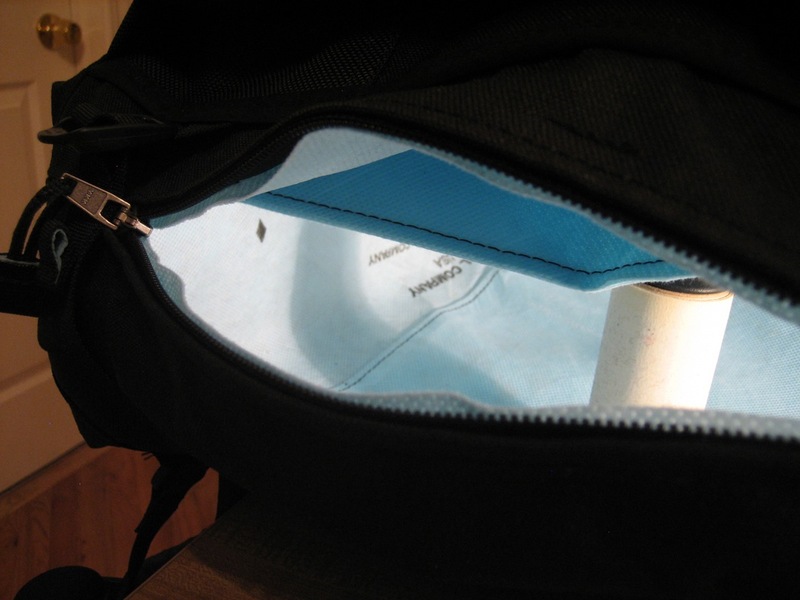 One thing that was planned on, was to build a very simple, slender, sliding pocket on the back side of the bag’s interior (as in, against the wall of the bag which comes into direct contact with the wearers back). This sliding pocket could be used for flat files, or a laptop computer, but what it was really intended to do was provide a slot for a structural device. 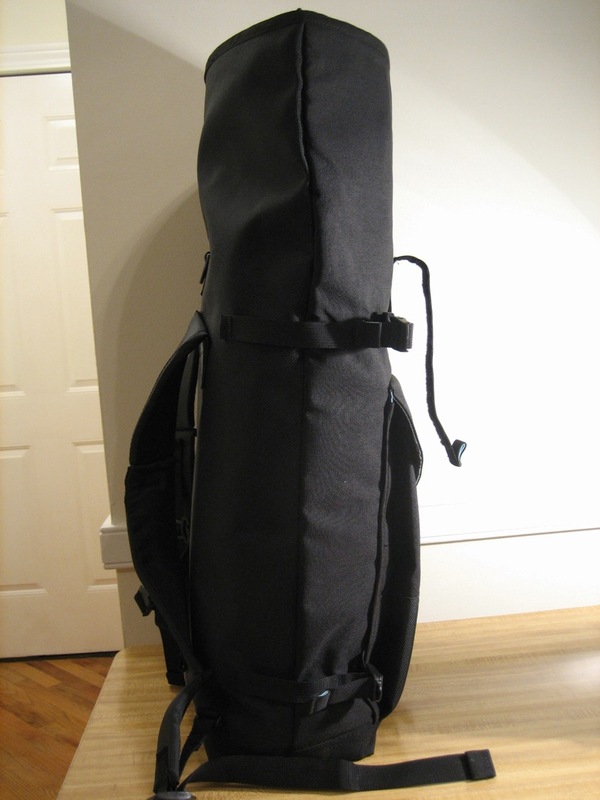 It would be up to the user as to how stiff that structural piece would be, it could be a thin piece of plastic to maintain the bag’s posture, or it could be a section of foam rubber for a light weight flexible yet stiff barrier between yourself and your gear. 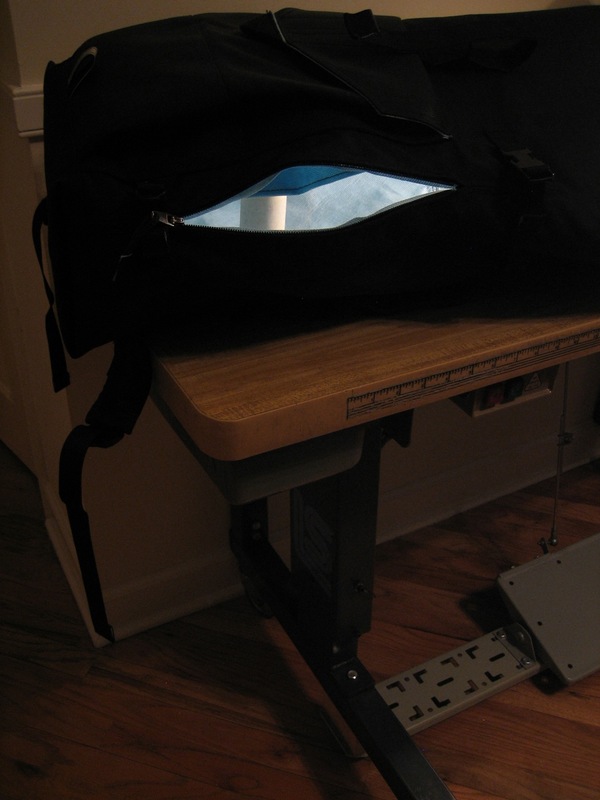 Really anything would work, if you did put a laptop in the pocket then the bag’s rigidity is certainly going to go from low to high along the backside, flat files maybe not so much. Either way, this pocket is made to hold a temporal support systems for longer treks and thus provide a more consistent shape, if carrying odd objects happens to be your vice. 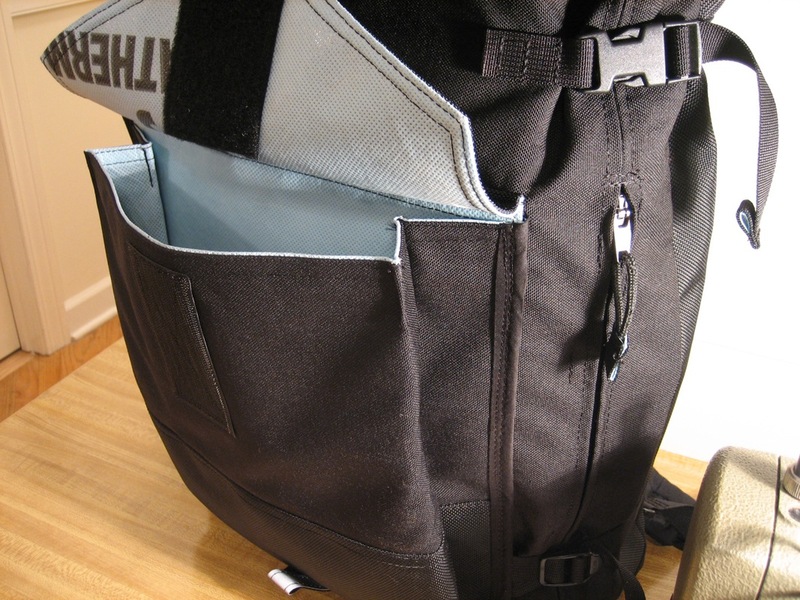 On the opposing side of the temporary-malleable-structure-slot is a series of slip pockets for all your other goods. 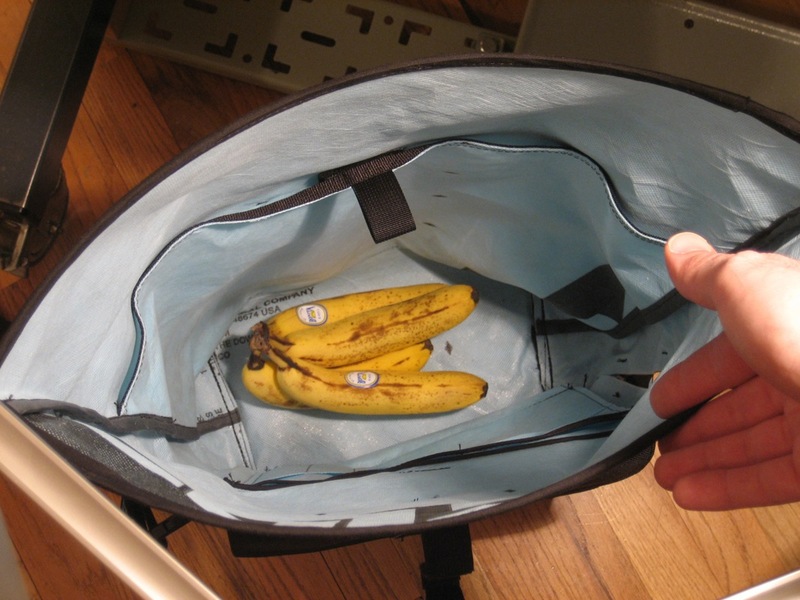 It was devised simply and plainly, with room for papers, a few pens, shallow pockets for MP3/GPS-like items, and even a pen slot sized for a bike pump. All of this was built with Dow Weathermate, aside from a bit of webbing, some bias tape, and a little Velcro (no inside zippered pockets). Once all of that was set up and ready to go, it was time to start tacking and stitching the few parts/seams that would marry these two integral sums of material. 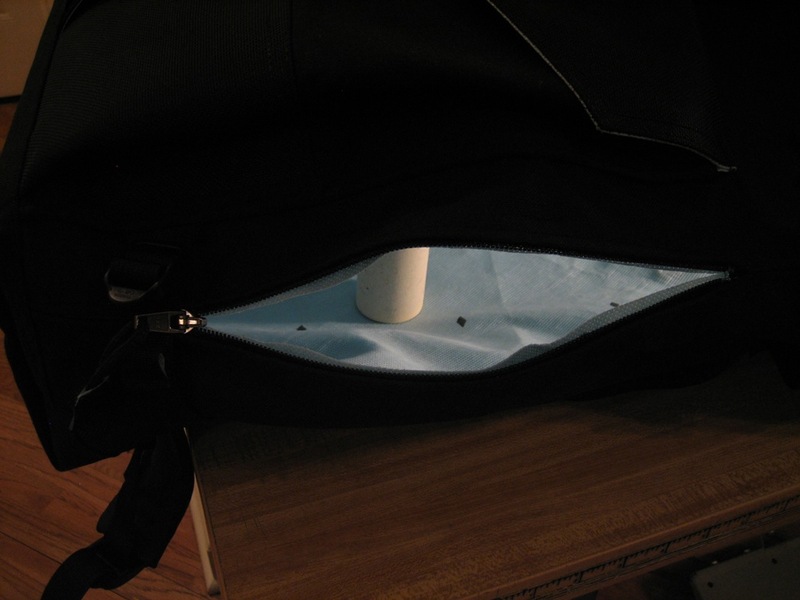 The first place to start was by tacking a few spots around the quick access zipper opening. 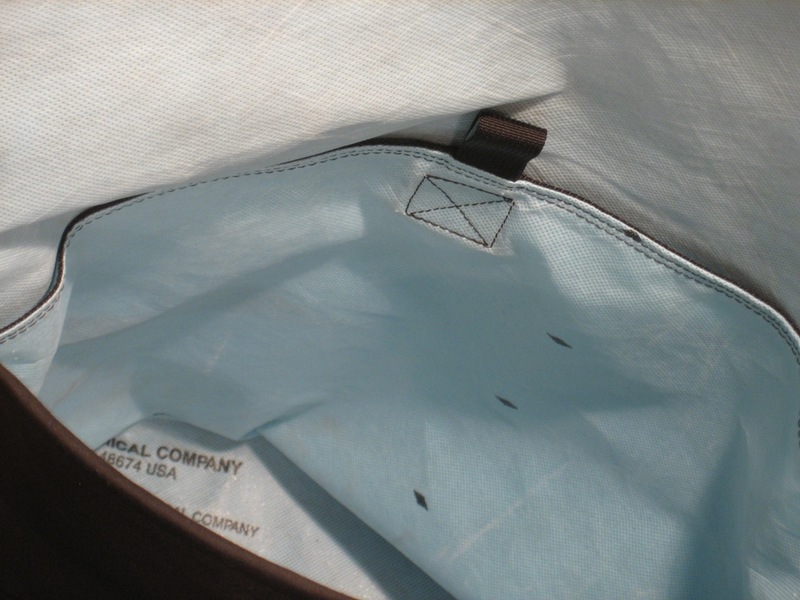 These were little 1″ long tacks that were placed around the zipper in six places to keep the outside material from separating from the inside material when going between the two, otherwise when you would unzip the bag, and reach in, you may just end up lost in-between the two layers, and not actually in the main compartment. After that, some added tacks were placed on the webbing of the lash points for the roll-top. Now it was finally time to confront the shoulder straps. 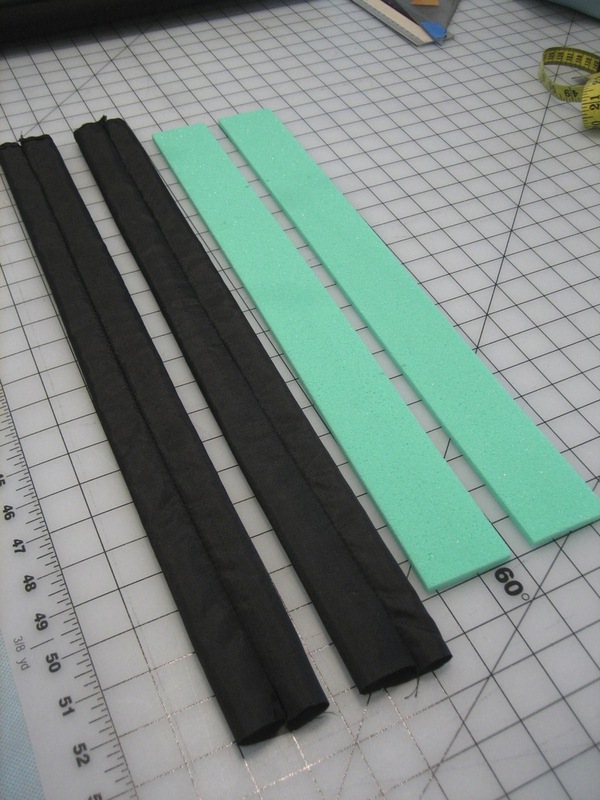 These pads, and the process of sewing them, was new for the Brother DB2-B791-015 and it was questionable as to how well it would sew through and/or feed the foam and nylon. The foam (rubber) came from McMaster-Carr and was extremely out of this world with a consistency like taffy on a hot day. It was chosen because it had what in theory were all the right properties; the foam did not need to be thick or particularly soft, the idea being – it was better to make a strap that displaced the load well, rather than do this poorly and make up for it with padding; two – thin padding would sew more easily – there was some concern that if the foam was too thick, it would not feed well under the Brother’s foot (if – at all, this kind of job may have been better suited for a walking-foot machine). What was found was a “slow-recovery super-resilient polyurethane foam”. It was chosen somewhat arbitrarily, but with the help of McMaster-Carr’s in depth explanations a few things were at least persuasive towards a more analytical approach; one was that this foam had the lowest “stretch” rate (stretching would obviously go against the idea of a shoulder strap, imagine if backpack’s shoulder straps were made of elastic..) and 2, it had the highest “deflection” rate, so it wasn’t too soft, and it was slow rebounding – therefore, it could be depressed and then sewn while it was still somewhat flattened, rather than competing with a foam that would not cooperate so easily. 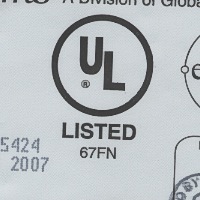 Lastly, this peculiar foam was “oil resistant, abrasion resistant, tear resistant, impact resistant, weather resistant, chemical resistant, electrical resistant, and met Underwriters Laboratories specifications” – good thing it was not needle-feed resistant. It was actually very easy to work with, and got along with the Brother like old friends. But how did we figure this out – you ask? Well by sewing with it on many different scales and using it for the custom-ergonomic shoulder straps which were painstakingly researched and crafted. It is true, many hours of research & development went into these straps, but all in all, they are still very simple, unlike some other over designed products we see on competing gear. On the ergonomics; the straps are configured to mimic an “S-curve”, that way they contour better to the body, climbing over the shoulders away from the neck, then turning in a little and back again towards the hips. But these are no basic “S-curve” shoulder straps, they were built with the idea of cutting down on material waste – if the shape were truly devised like an “S” then the total usable area of a square material sheet would be significantly reduced due to these curves. In order to maximize our limited materials, there had to be a way to make simple, long and slender, rectangular straps that could also be “S-curves”. 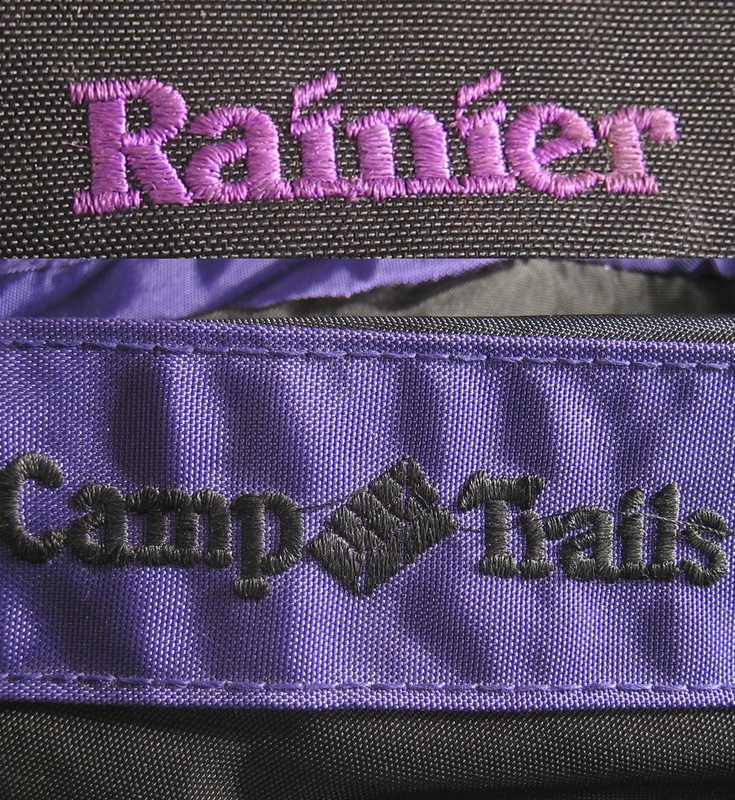 This was accomplished by making two nylon sleeves (the nylon was coerced out of the CampTrails pack) that were approximately 2″X20″X.25″ which the foam would be inserted into. However, even though the foam pieces were cut to nearly the same dimensions as the nylon sleeves, they were altered with two small “V” cuts (one on each side, about 5″ from the ends) that would create a place to bend, or almost pleat the materials into an “S-curve”. Once they were inserted, it was very simple to fold the apparatuses over at these points, and stitch them into permanent position, then when they were unfolded, the shoulder straps formed a slight “S-curve”. This may seem like a small success – but it is significant for the NeedleFeed, as the foam rubber is not cheap, and the amount of nylon which will be conserved can now go to more tangible causes. There were still two items waiting to be tacked into the shoulder straps, first a section of webbing which would act as a track for a sternum strap, and then the ladder lock buckles that would meet the webbing that was anchored in at the top of the boot (bottom of the bag). 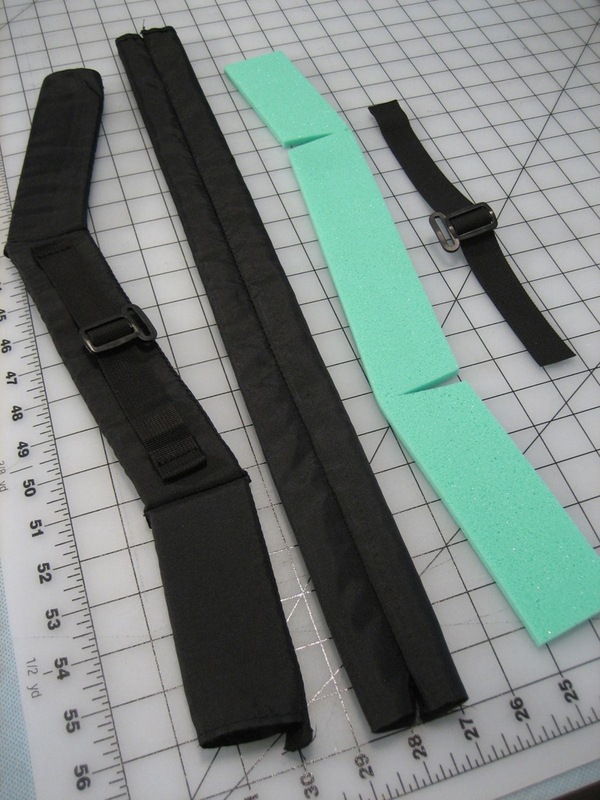 The webbing for the sternum straps is about 8″ long on both, this provides plenty of adjustment for different shaped torso’s and for adjusting to how taught the bag rests on the back (whether it is slack, or high & tight). 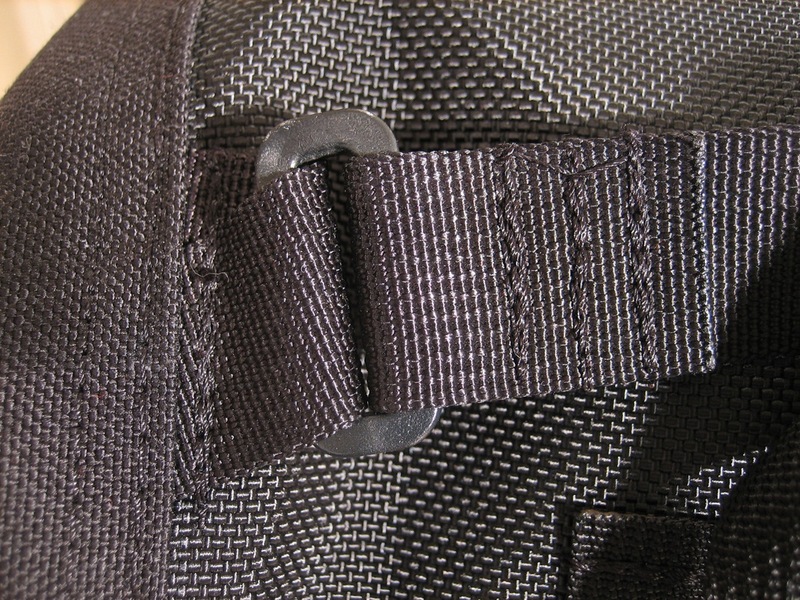 The ladder lock buckles are plain and simple, underneath them the excess nylon is tucked away for a clean finish. All that was needed now before sewing the bag into shape (finally, after 6+ weeks of waiting) was to sew the shoulder straps on once and for all. 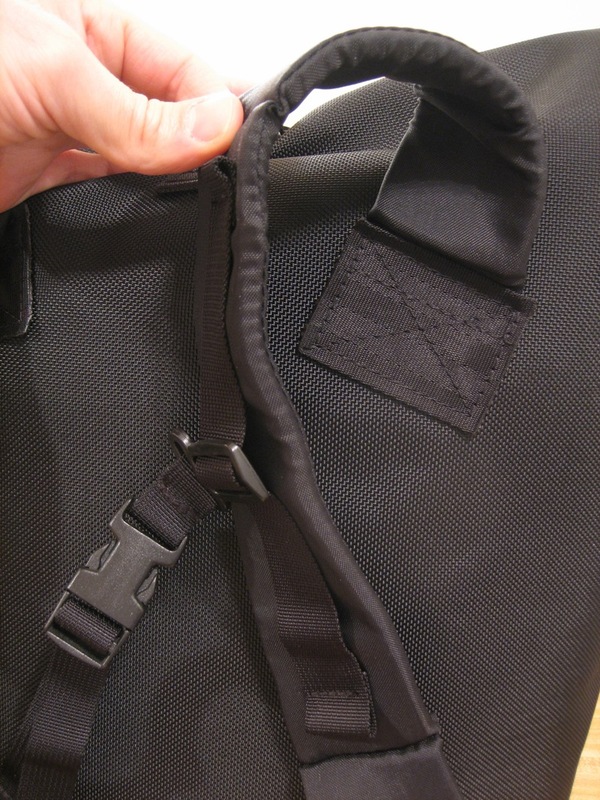 Taking two sections of 2″ black seat-belt webbing as patch/reinforcements the straps were located centrally to the upper compression straps at a bit of an angle to direct the shoulder straps around the shoulders (duh). 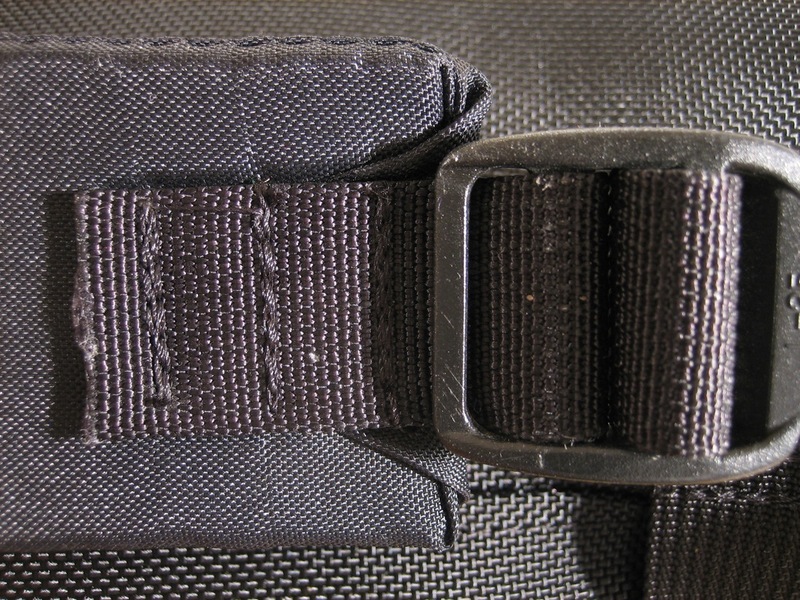 Looking at a cross-section of this you would see (top to bottom, outside to inside); 2″ black seat-belt webbing layed over the excess nylon (which extends well past the foam), then over the Ballistics, and then to the Dow Weathermate – this should provide a well structured area that helps disperse load evenly to the main body of the bag. For now that is all for the shoulder straps, surely more info will come to mind later, but until then it’s best left behind. The main body was now ready to become something other than a lumpy mess of materials. Just as was done on the Dow bag, and pretty much everyother bag that has been made around here, the sides were stitched together with bias tape and a few staples to keep things in place until it was all secure. Then the two ends/bottoms/dog ears were stitched in, and sure enough it looked and felt like a walking bag. The last thing to be done was stitch in some bias tape around the rim of the bag, however, this was done with an equal amount (in length) of boning. Boning is a stiff plastic ribbon that comes in different widths, it is easy to sew through and is often used in making corsets, to make them stiff and supportive(?). Although, boning can be used for all sorts of things, and because here we were making a “roll-top” bag, the added stiffness in the rim would be beneficial for performance. Without the boning, the top would probably be too floppy, and would be somewhat awkward to roll down, unlike using these plastic pieces that make the top ends self-aligning and smoother rolling. 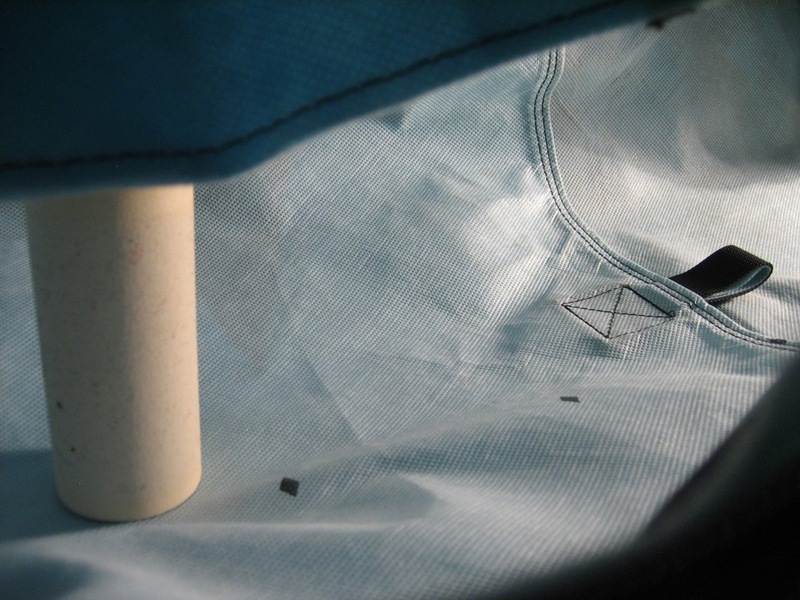 The top edge is then, bias tape embedded with 1/2″ boning – and the monster was now a walking bag. This project was without a doubt highly encouraging, even with the mis-cut mishap. Plans for more walking bags are already in the works, however the focus will be on the Dow Weathermate, and, simplified forms of construction to help accelerate build time, and get more out to the masses for testing. It’s hard to say what the next generation will look and feel like, but some of the main considerations are how to make them even simpler aesthetically, and more light-weight without losing too much of the organizational features; see how how far you have to go before curiosity kills the cat – so to speak. Forgetfulness; Aside from the anchor points used to attach the bottom sections of webbing for the shoulder straps, there was also a little reflective piece tucked into the front side fo the bag along the boot seam. It is just a loop of webbing with some 3M Scotchlite Reflective Tape stitched on top, then made into a loop, it could be used as a tie-down point, or a life-saver. 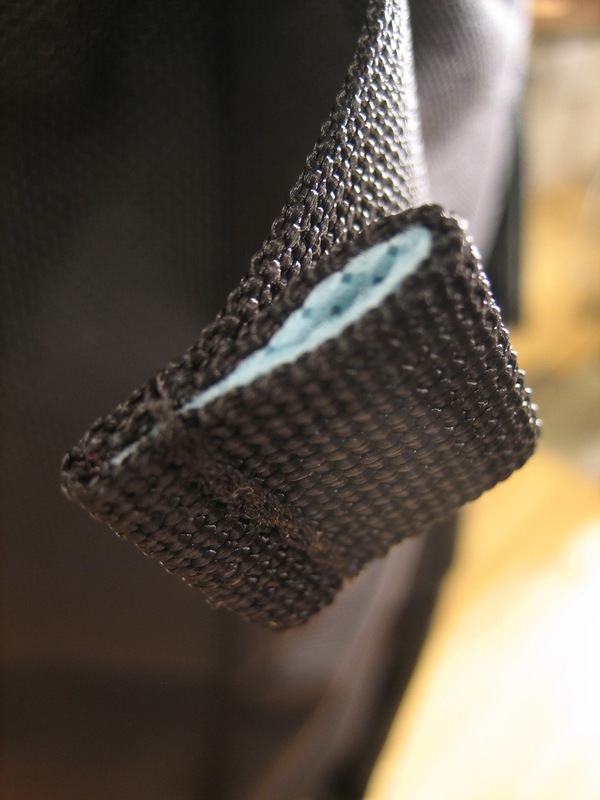 Also there is a small Velcro backed piece of webbing that comes off of the lashing for the roll-top. 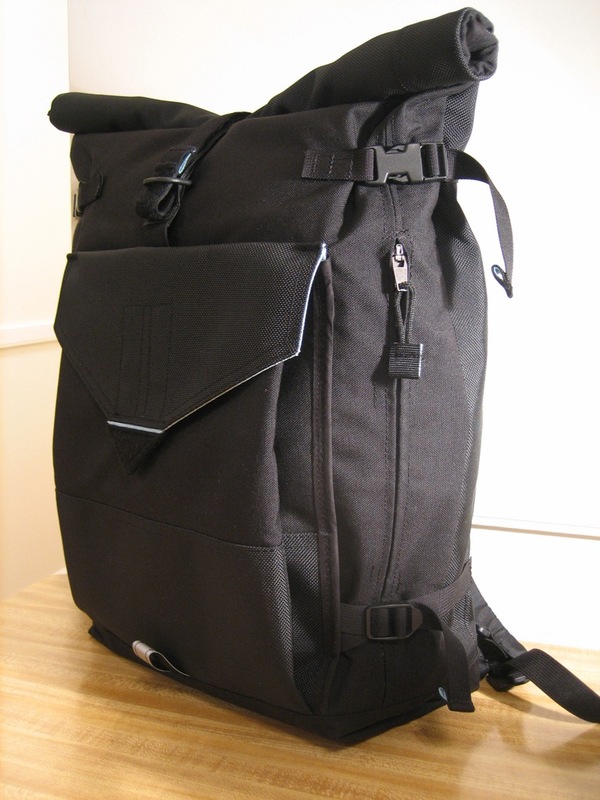 It was intended to be used as a securing device for the U-Lock incase it was ever jostled around/or out of the pocket (which is clearly not an issue, after having tested the bag). Unfortunately it is too short to get around the U-Lock and have enough left to firmly interact with the other Velcro side, maybe someday a new use will be discovered for it. The next generation of inclement weather shoe covers have been completed. This time around the process was both simplified and made more complicated (strangely enough), however this was to their benefit, as the features should now be more efficient, and the fit is better adapted. While the first generation of bootie has been a mostly successful venture, there were a few things that were done differently here. Rather than go through all the motions again, the latest developments will be highlighted only. If there are any questions regarding these issues, please refer to the initial posting at Inclement Weather Shoe Covers. Starting with the fit. Although this is fairly obvious to some, it was hindsight here. 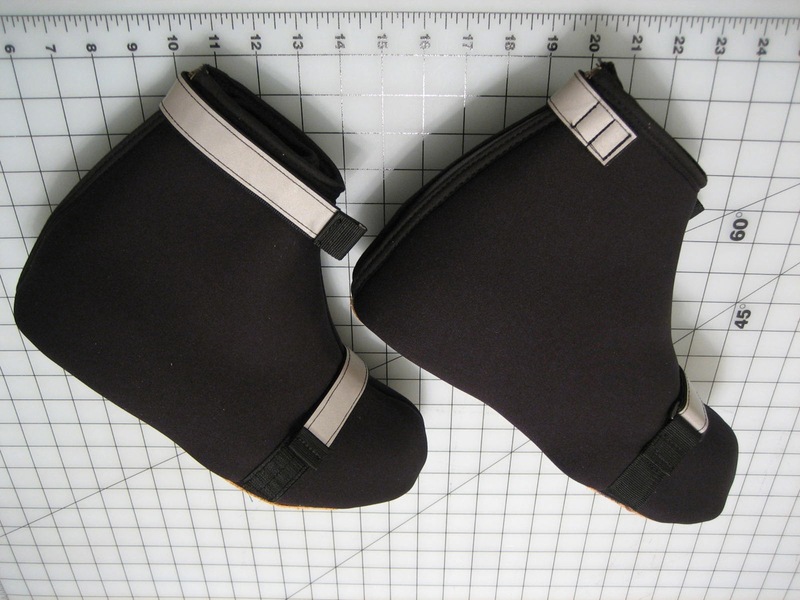 The two panels of the upper bootie needed to be re-proportioned to accommodate a slightly different tolerance between the inside face of the bootie and the outside face. Using an expendable material, three sets of patterns were developed, slowly refining and scaling down the inside face from the outside (conversely – the outside face grew larger, it is hard to say which came first/going which way, the chicken or the egg?). The result is a similar shape between the two, but now the outside face has a longer dimension along the bottom seam, with accommodations made to fit the rest of the proportions into each other’s corresponding alternate edges. What this achieved was a more precise fit around the circumference of the sole, because the outside of the soles edge is longer than the inside edge – when measuring from the center of the toe to the center of the heel. That alteration cured the bunching around the zipper on the first pair, and also kept the heel area nicely compacted around the boot. On the first pair, the heel area was a slight issue, because the inside face of the bootie had been pushed a little bit towards the front, which caused an excess of material almost exactly where the crank is closest to the heel and therefore rubbing commenced. Now that the heel is properly fitting, the need for the lower position second strap, which held the material tight in that area, is (should be) unnecessary. The second adjustment to the design was to incorporate a strap along the span of the bootie, which would cross from the inside of the foot to the outside, approximately over the ball of the foot. This, like the heel, was also to cut down on any potential rubbing that occurred at the front inside quarter of the bootie against the crank. In order to keep this as low profile as possible a traditional over and back strap method was used. 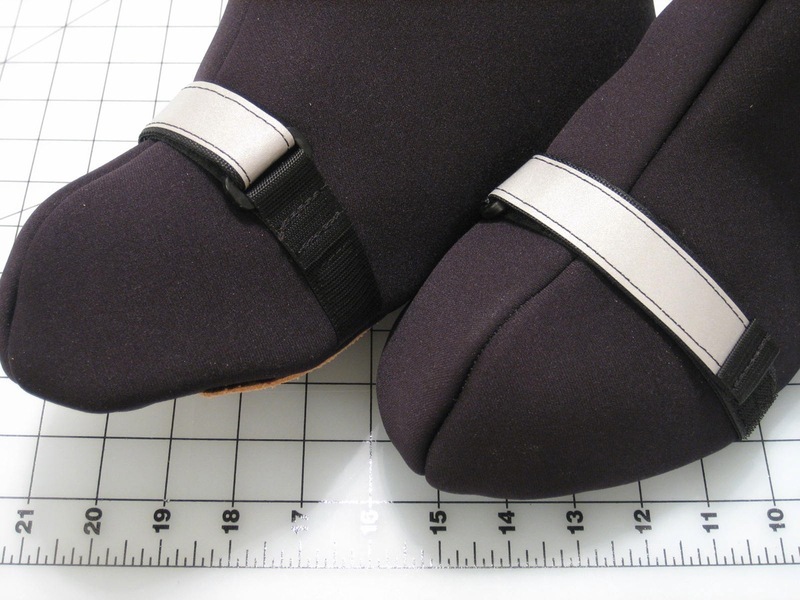 Essentially there is a small plastic 1″ loop that was sewn into place about an inch and a half up from the sole – on the inside, this created a place for a Velcro strap to come over the top of the toe from the outside and double back on itself to adhere the hook and loop of the Velcro together. This strap can be cinched down accordingly to either keep the bootie in position, or to relieve any rubbing that may occur between the crank and the bootie. 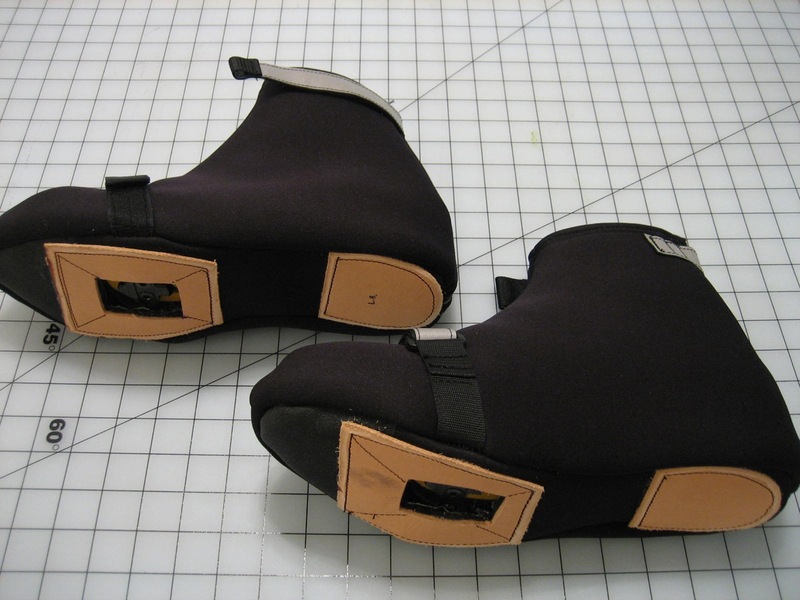 Next, the leather reinforcements on the bottom of the booties were cut slightly different to increase protection from the ground, and the edges were also skived to provide a better transition between the neoprene bootie sole, the glue, & then to the leather. The skiving should prevent any snagging as the profile has been reduced. Also, the leather reinforcement under the toes were stitched on with an “X” instead of around the arbitrary cleat opening*. This will help because instead of making a stitching pattern around the suggested cleat opening, which may just get cut off when opening the hole, to make it easier to “click in”; the “X” stitching will keep stitchesconsistently spread around (in the general area) the opening no matter how much it is scaled up, or down. 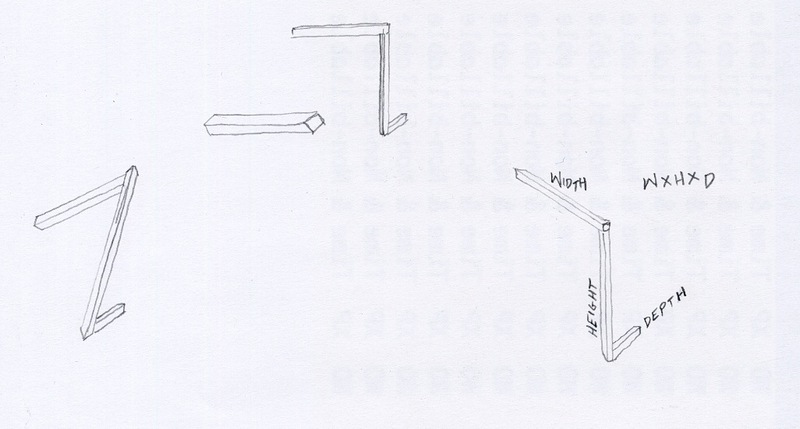 Imagine cutting a square from a square – out of two sheets of wood stapled together, if the fasteners form an “X” between the two, leading from the corners, then no matter how big a hole you cut, the fasteners will always end up right at the newly cut corners – extending to the outside corners (no?). As for any other upgrades, which there are a few, they are additions to the current design rather than refinements in the pattern. The first is a more dependable and consistent type of reflective webbing (made by 3M Scotchlite), which was stitched into place on the straps. The new reflective tape is a hardier version than the last, and has increased visibility due to size, and grain structure/properties. This ribbon “guarantees” visibility in low light at 700 feet or more. 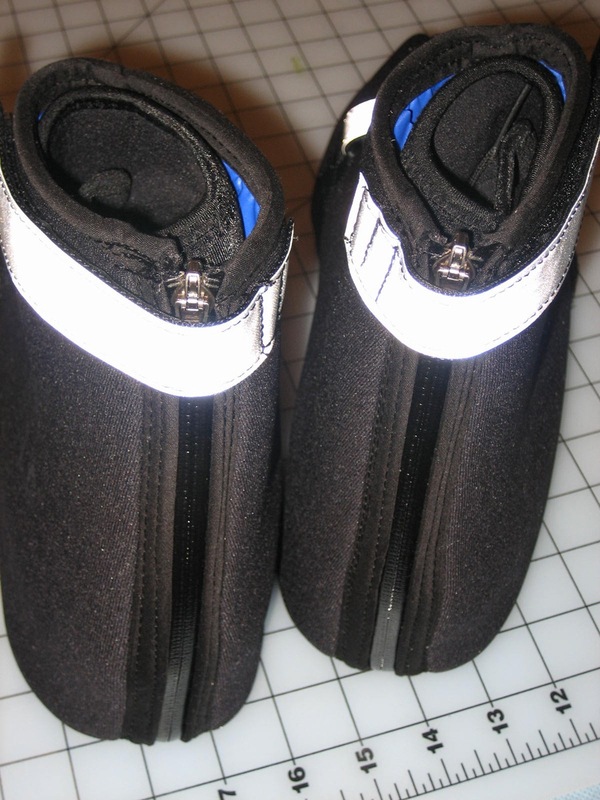 The tack at the end of the two straps (per boot) was also minimized to cut back on bulk. 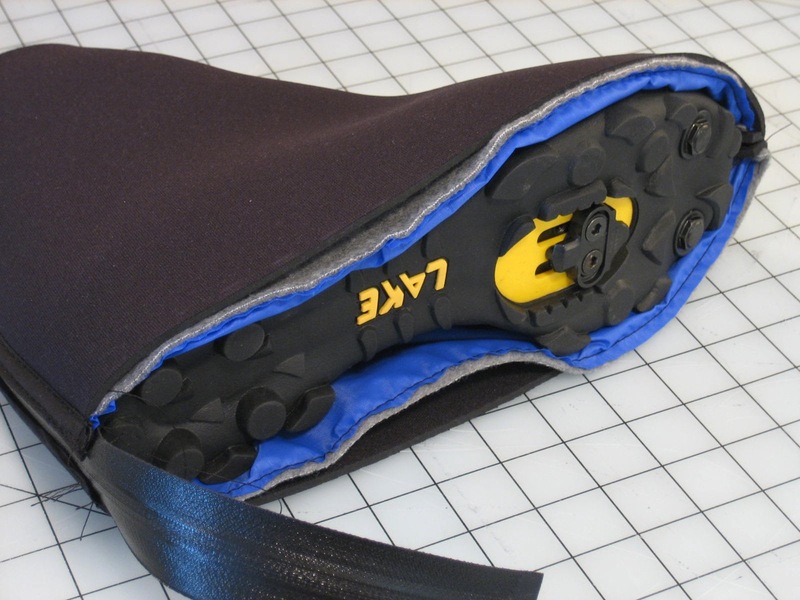 Lastly, on the very front section of the bootie’s sole (the pads of the “toes”) – where on the last pair we were beginning to see wear from the action of pushing off the ground right before clicking into the pedal to ride – an additional layer of Tough-Tek/Slip-Not Non Slip Fabric was placed to cut down on excess abrasion in that area and activate grip. Finally (? ), the upper’s inside layer of nylon has been changed, now it is a 1.9 oz per square yard silicone coated rip-stop nylon (excellently bright blue). 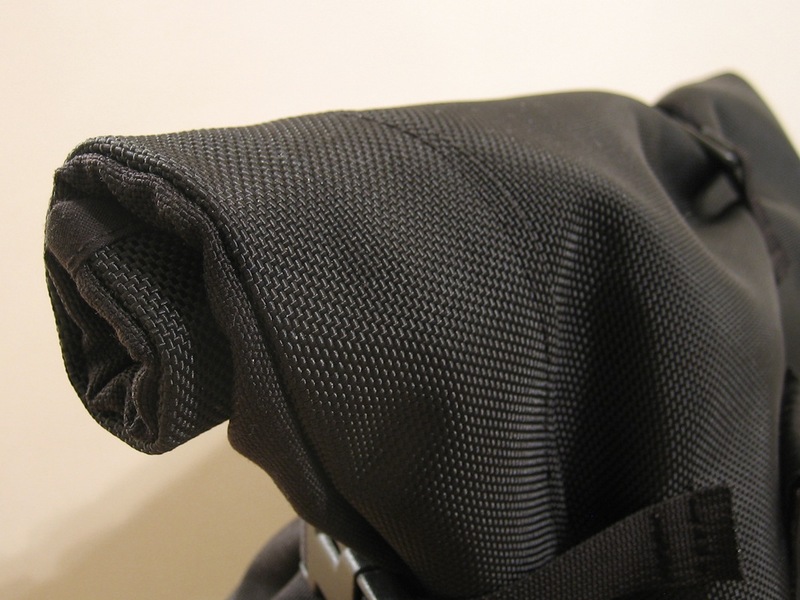 The coating in conjunction with the rip-stop prevents the likely hood of both fraying and tearing. All of these improvements have made a big difference, thus far. The biggest accomplishment has been in the pattern, which by now can hopefully be sized up and down to accommodate other shoe sizes. However that may still be a challenge, as these booties are custom made to fit a very specific winter cycling boot. Probably, the pattern will always have to be made one-off, every-time. That should be for the better, and if anything will always ensure proper fit, scrutinous care in the early phases of production, and even more intense focus during the stitching. If this pattern were simply scaled up, or scaled down, it would not have the same affect size wise. These will always be slowly processed for the added quality. As for the Brother DB2-B791-015 it does very well in this application, even for a flat-bed machine. One thing that will be altered next time is to use a single-sided presser foot for sewing around the heel, this will allow the material to take that round shape more easily and hopefully further reduce any puckering in the pattern. *The reason for using this “X” pattern when stitching on the leather pad at the cleat area, is mainly due to the Brother being a flat-bed machine. 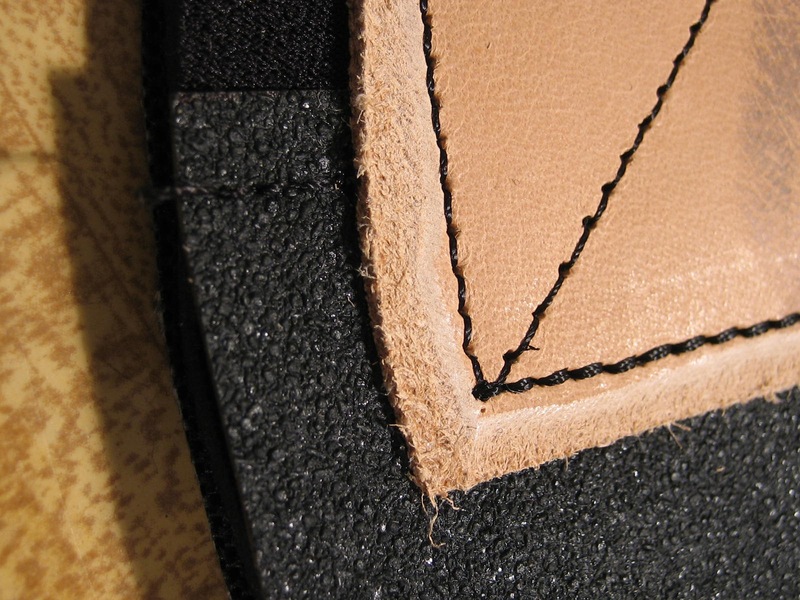 If it were a cylinder-bed, or post-bed, then the leather pad could be stitched around the cleat hole after the entire bootie is built, because the machine could actually get all the way up there towards the toe without the added material getting in the way and restricting this possibility. However, with a flat-bed machine, the pre-planning has to be a little more creative. So while almost any pattern can be stitched between the leather pad and the inner,mid, and outer soles before the sole is stitched to the upper, you can not add stitching later (once it is a complete bootie). The only way to insure that the cleat opening is correctly positioned, is to cut it after the bootie is complete, so that it can be on the boot, where everything is aligned as it will be from then on. Instead of guessing where the hole will be, and then end up cutting it larger later, thus loosing the stitching we put around this opening earlier, we have to devise a way around this. Obviously glueing the leather pad makes a huge difference, but if we want the added benefit of some stiching, a system had to be created that would take place in the early phases of construction that would provide that extra strength whether or not parts of it are cut off at the end. Certainly there are many patterns that would work, working the stiching in back and forth across the shape, moving in a circular motions until you reach the outer dimensions, or even tacking in miscellaneous places; but for simplicity and avoiding an abundance of unnecessary stitching, the thing that made the most sense, was to stitch across the shape from corner to corner. As was discussed earlier, this will distribute the stitching evenly across the plane of the leather pad and increase the potential strength of the left over stitches by them sharing equal amounts of stress. This is a hypothesis at least, these booties being the first pair to implement the test.